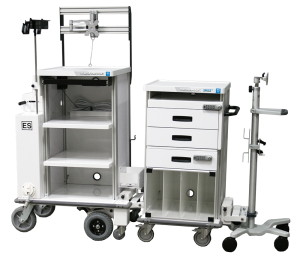 Practical and innovative health care equipment improving safety and productivity in hospitals. Karis is the Canadian distributor for a vast range of PHS West, Inc. fully customizable endoscopy carts and practical health care equipment solutions, providing material handling safety and efficiency. 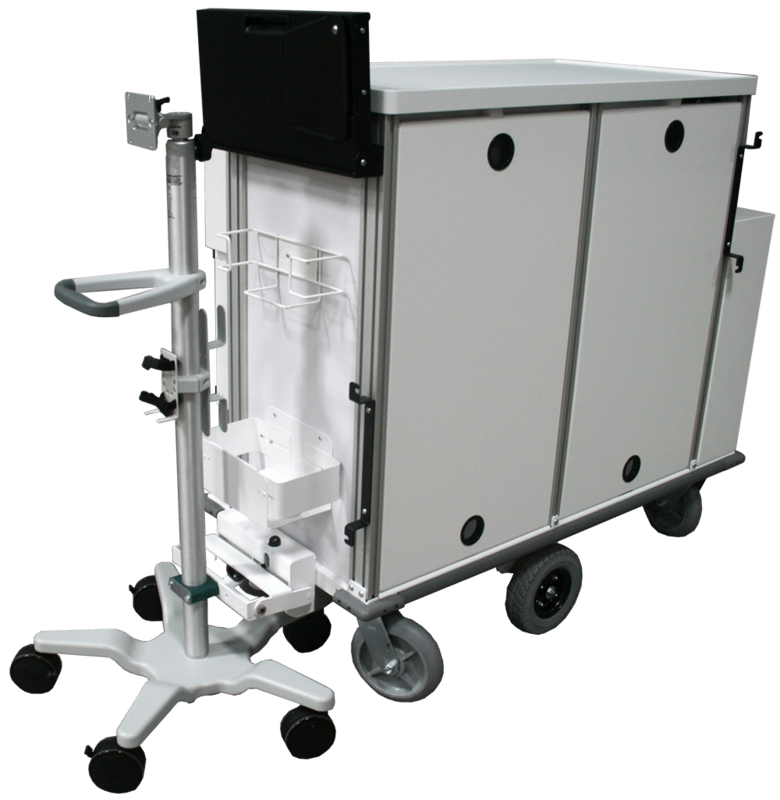 Karis brings the Canadian health care industry practical and innovative treatment equipment. Featherweight® Endoscopy Carts are custom built to be the perfect fit for your needs. 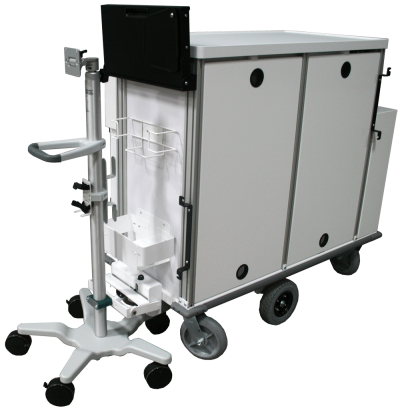 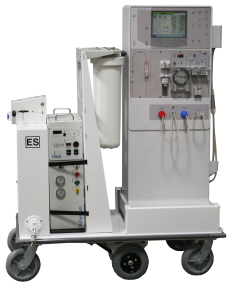 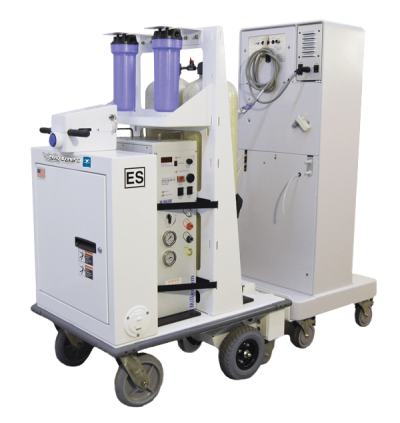 Whatever your design requirements are, PHS West, Inc. endoscopy carts are the solution. 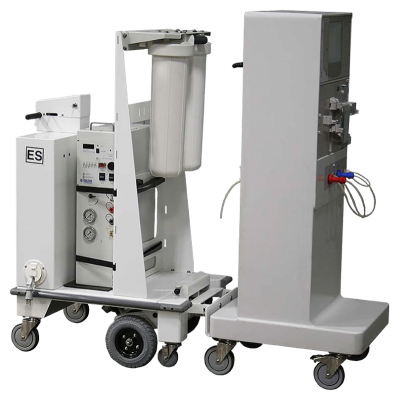 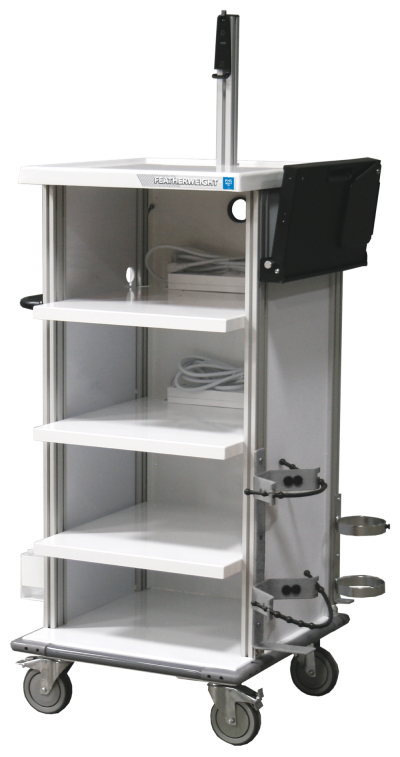 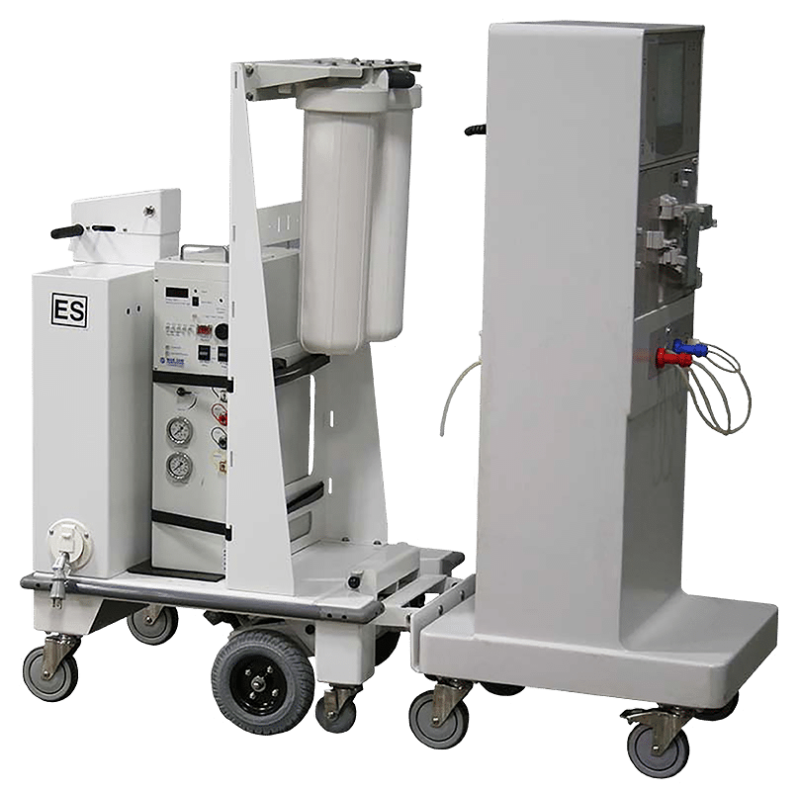 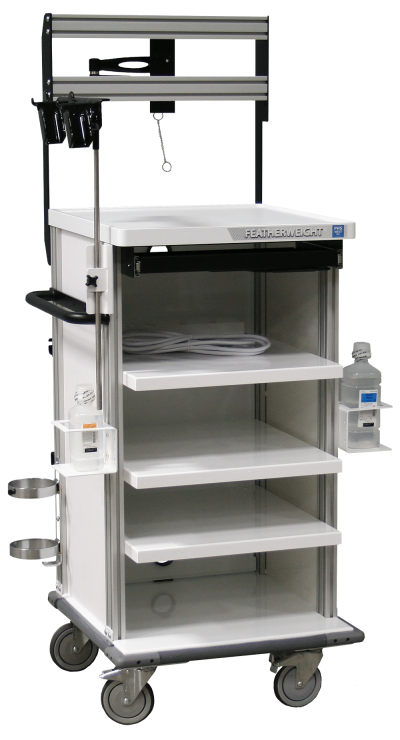 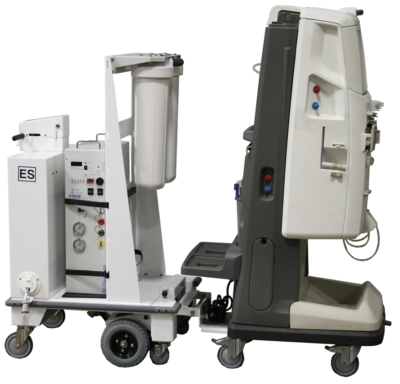 More than 20 years ago, PHS West, Inc. became the innovators of the endoscopy travel cart. 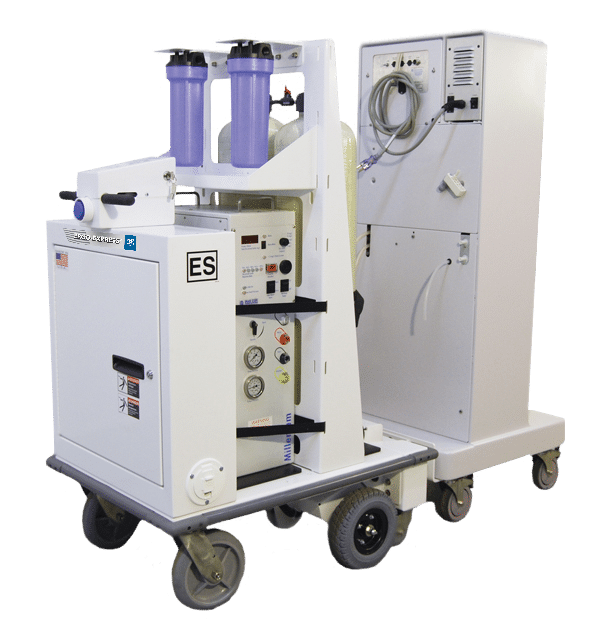 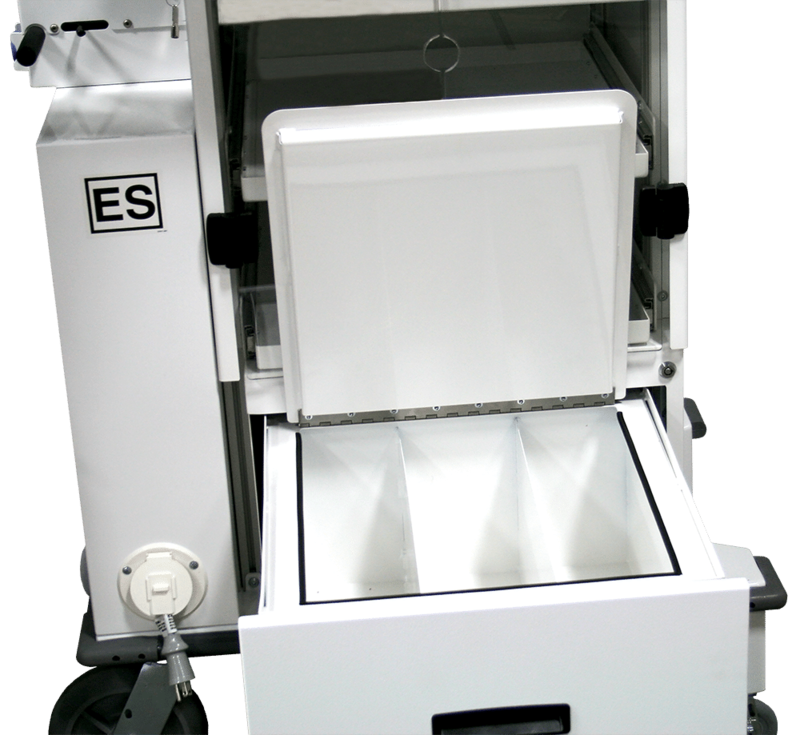 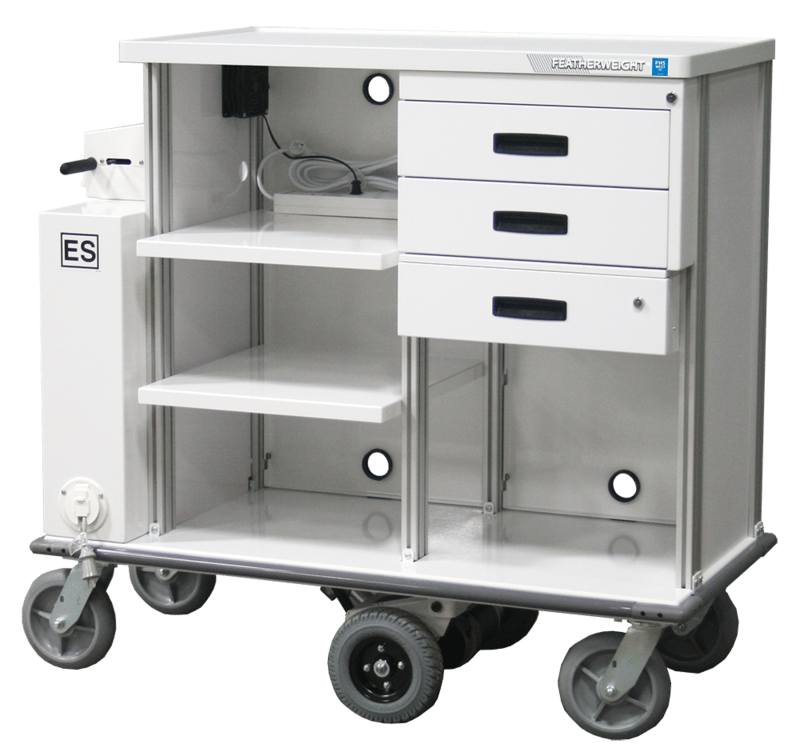 Our endoscopy carts are designed to be 100% custom built so we can meet your department’s exact equipment, supply, footprint and, most important, budget requirements. 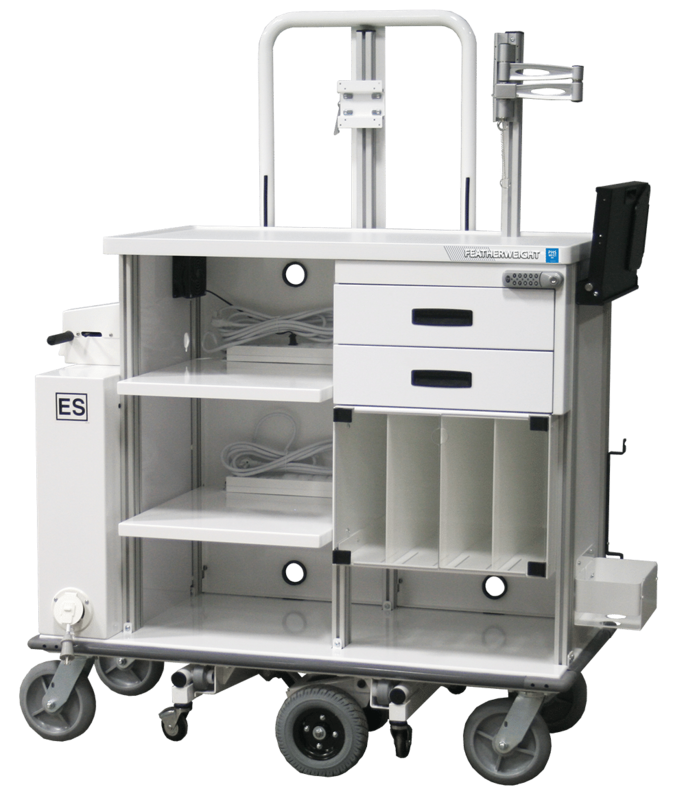 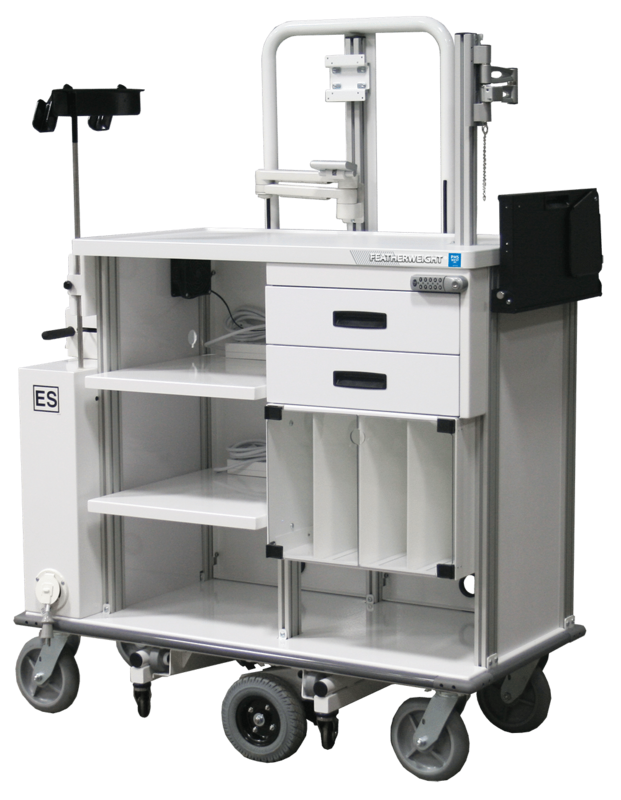 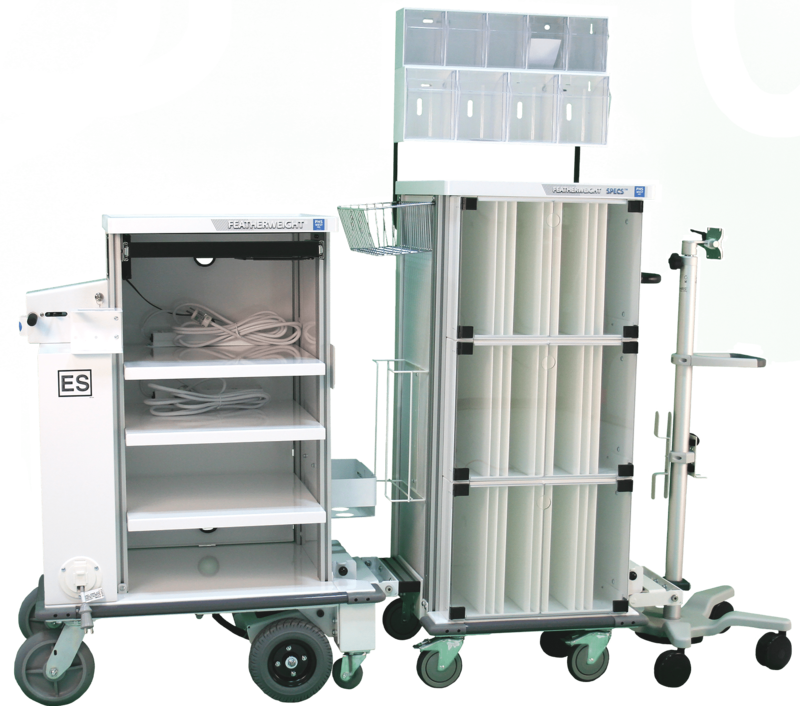 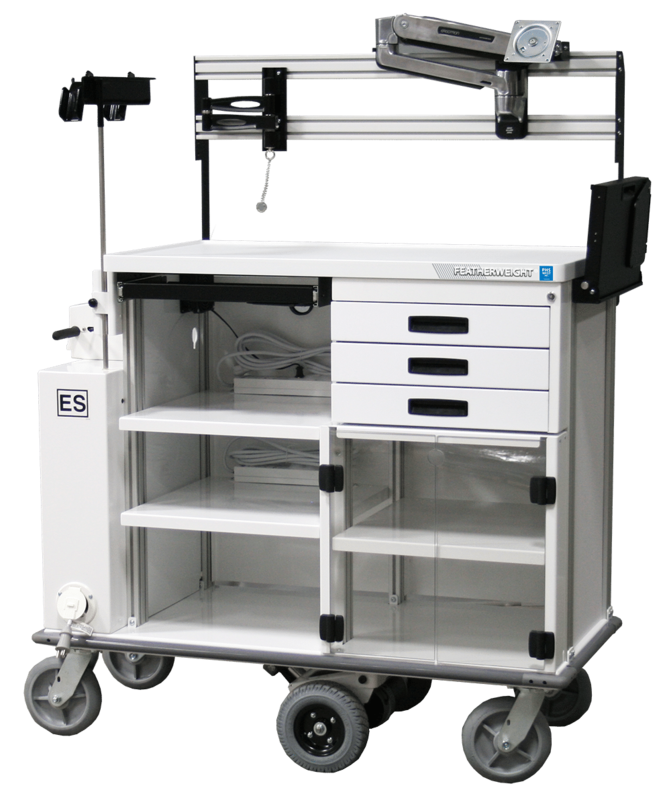 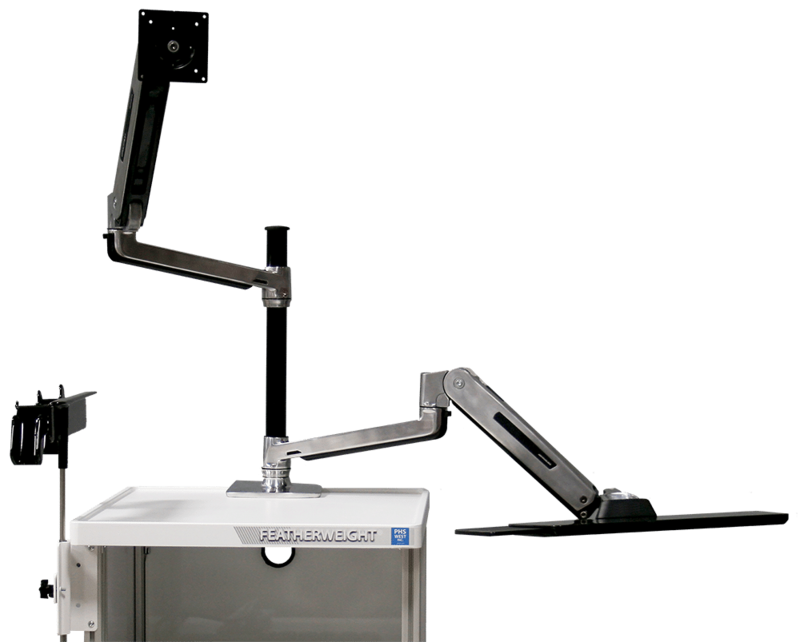 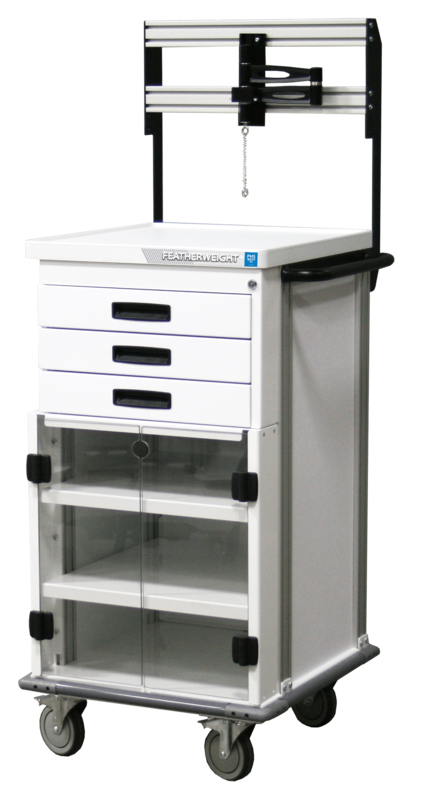 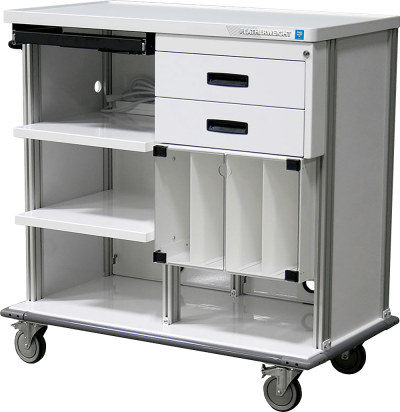 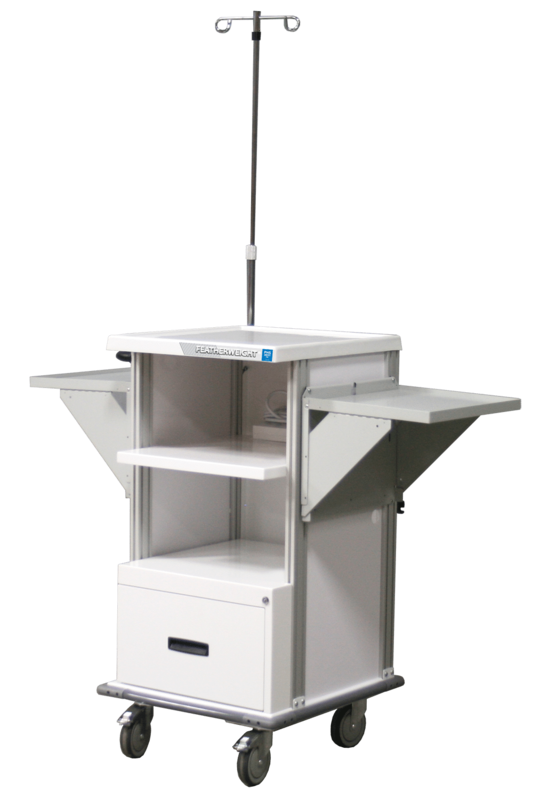 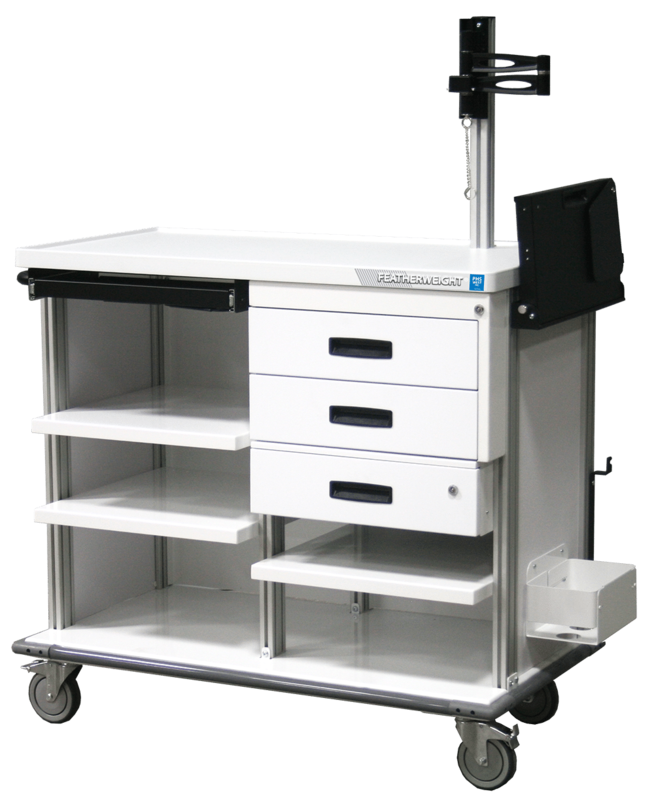 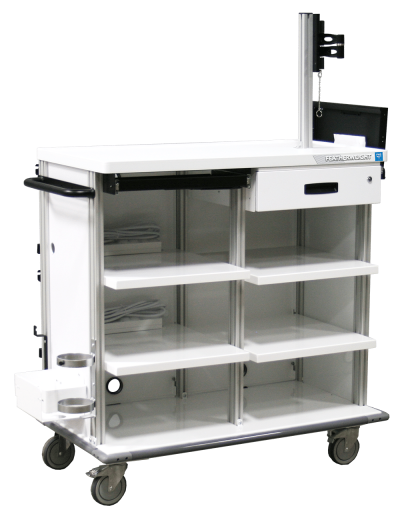 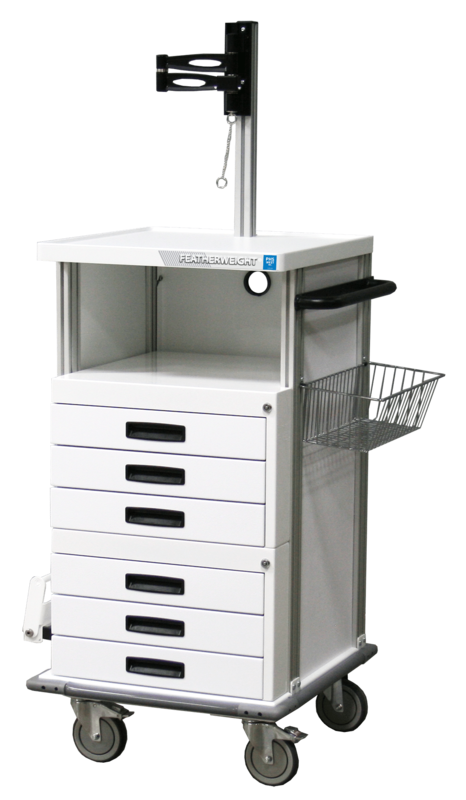 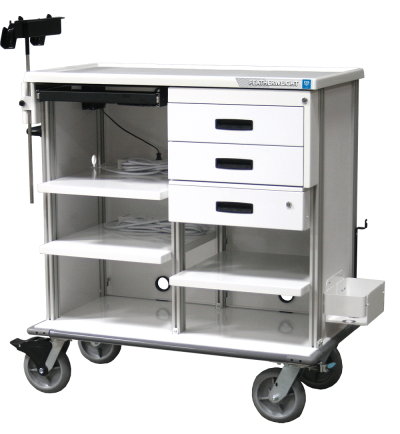 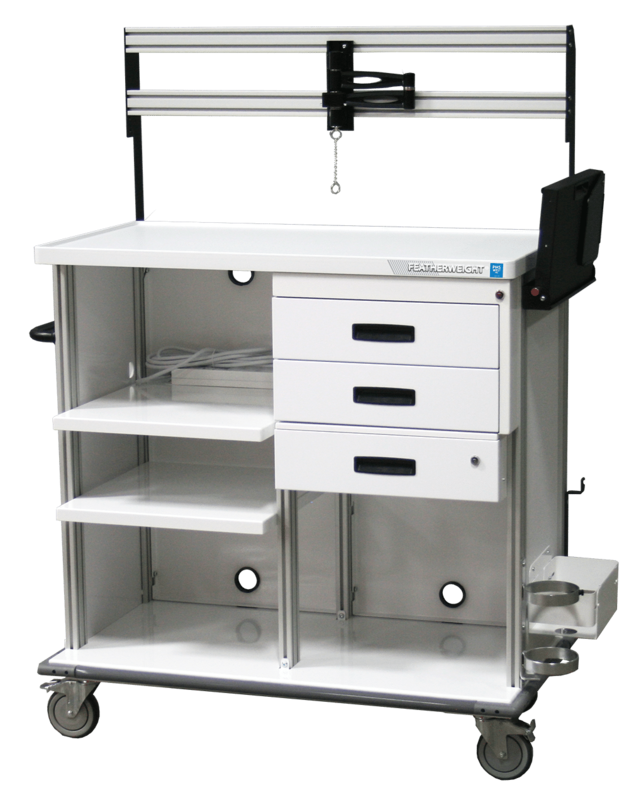 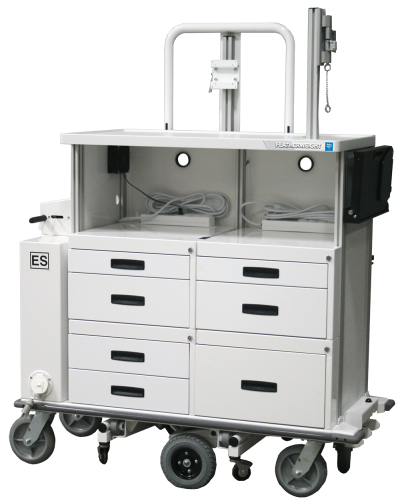 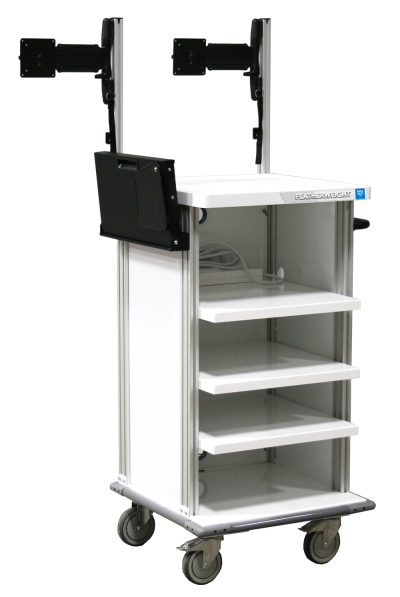 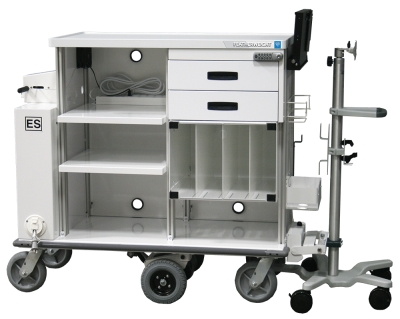 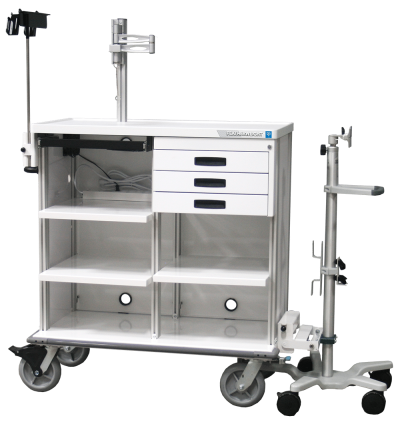 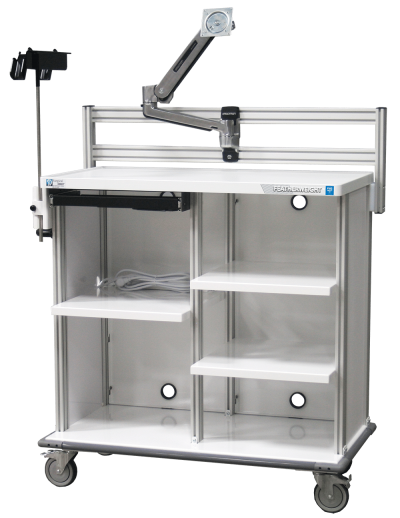 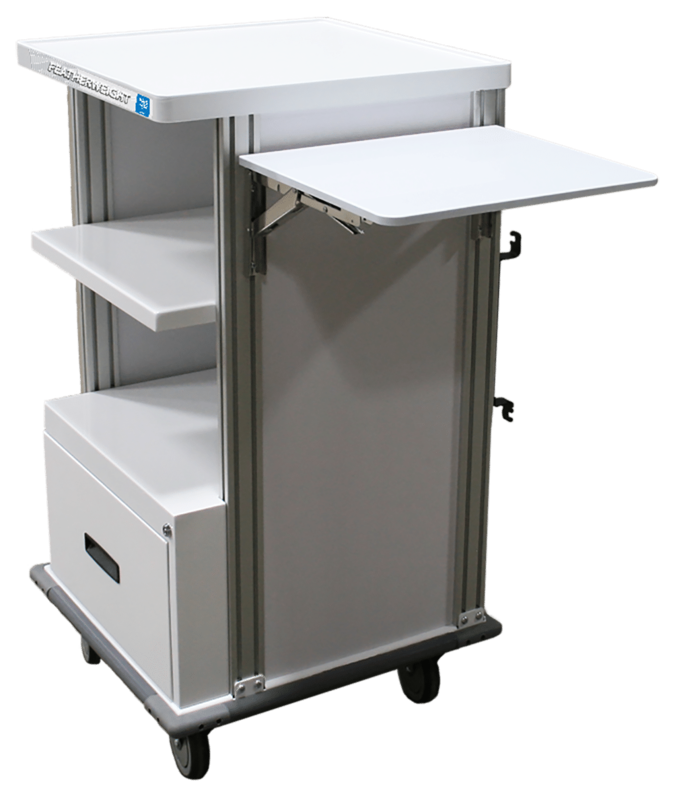 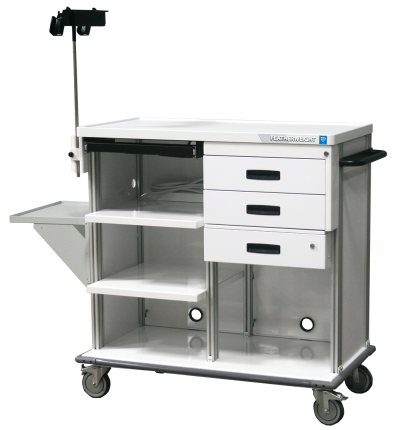 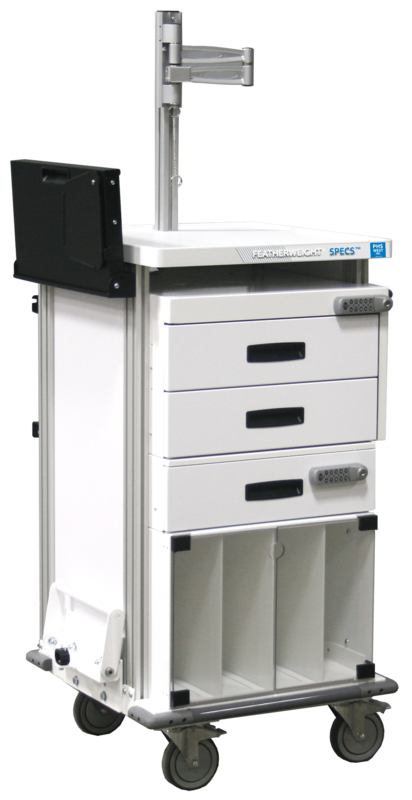 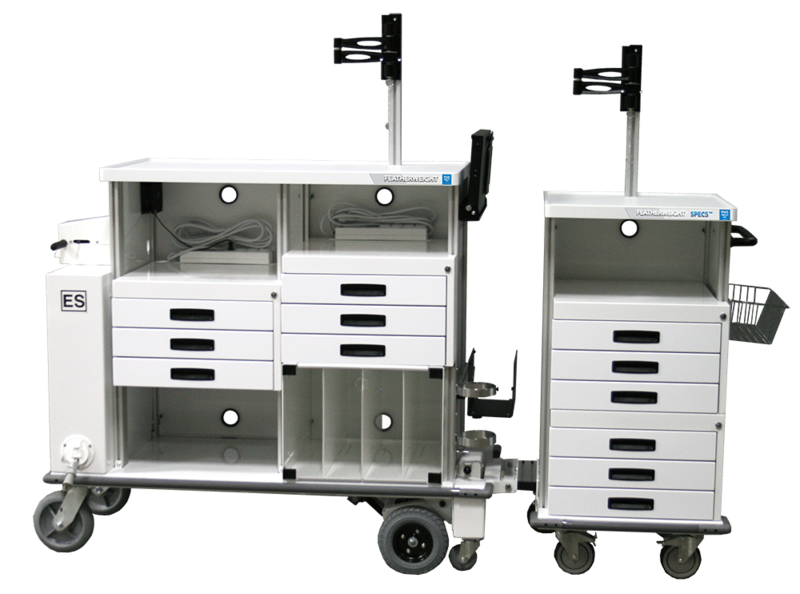 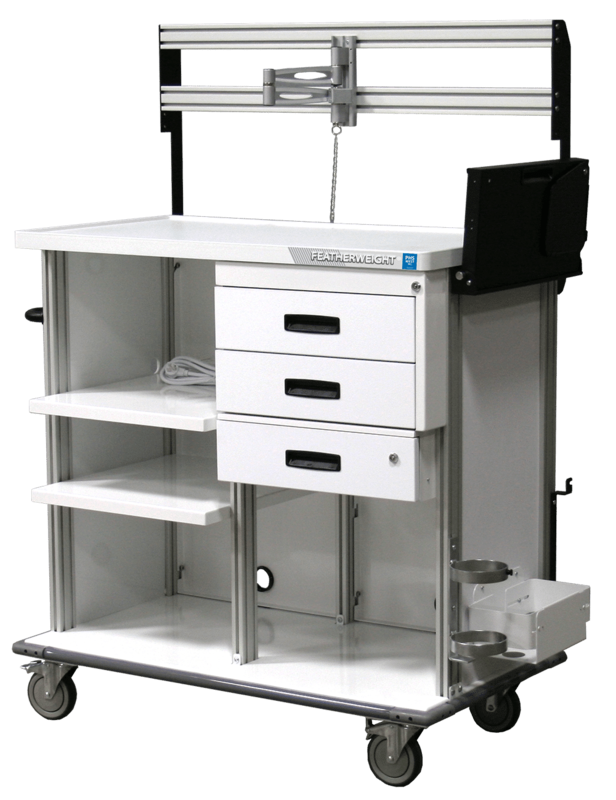 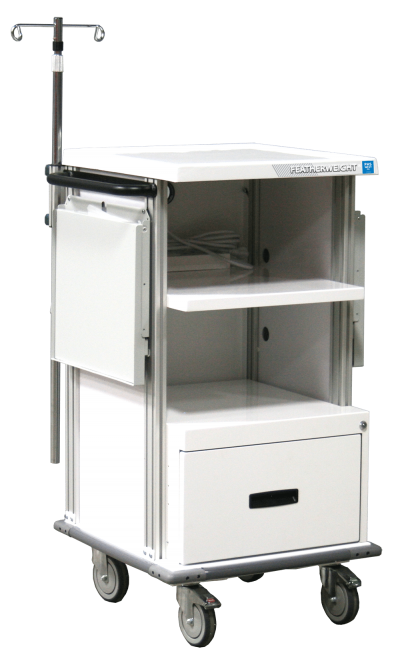 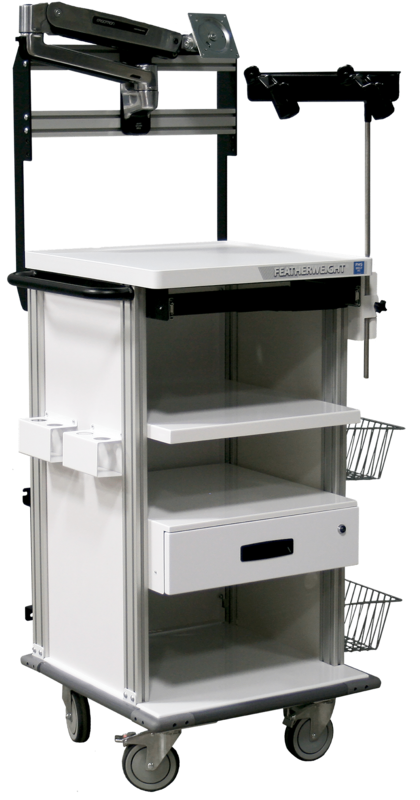 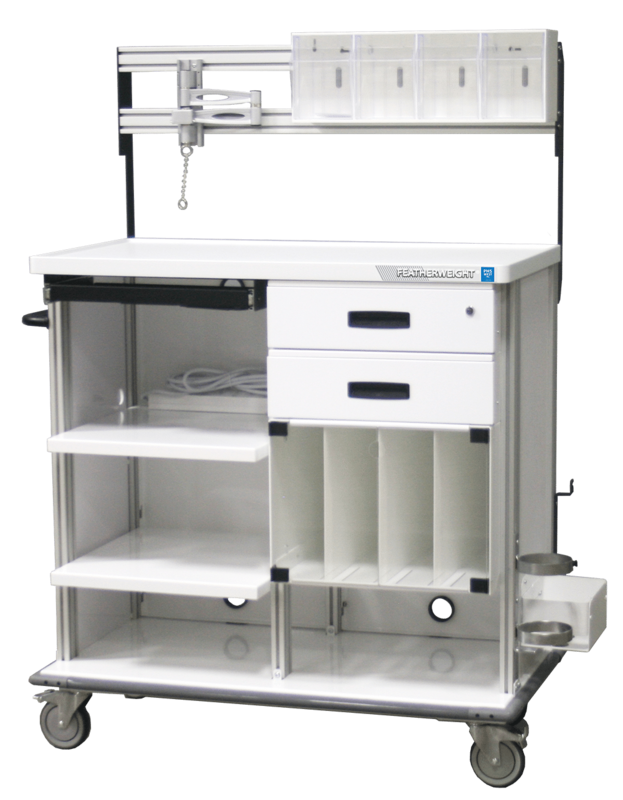 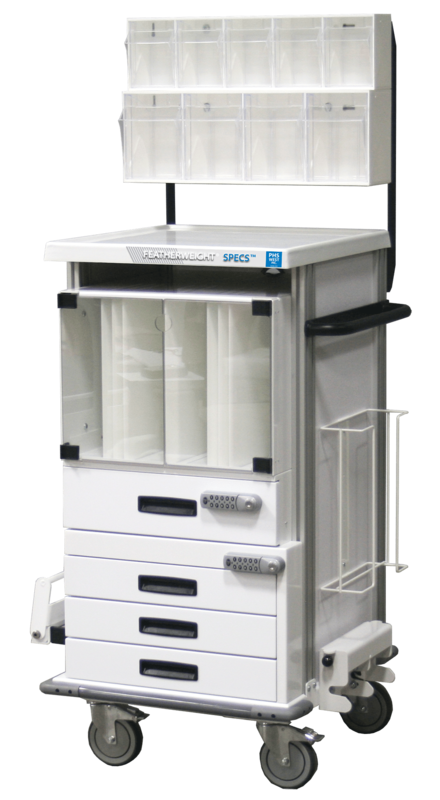 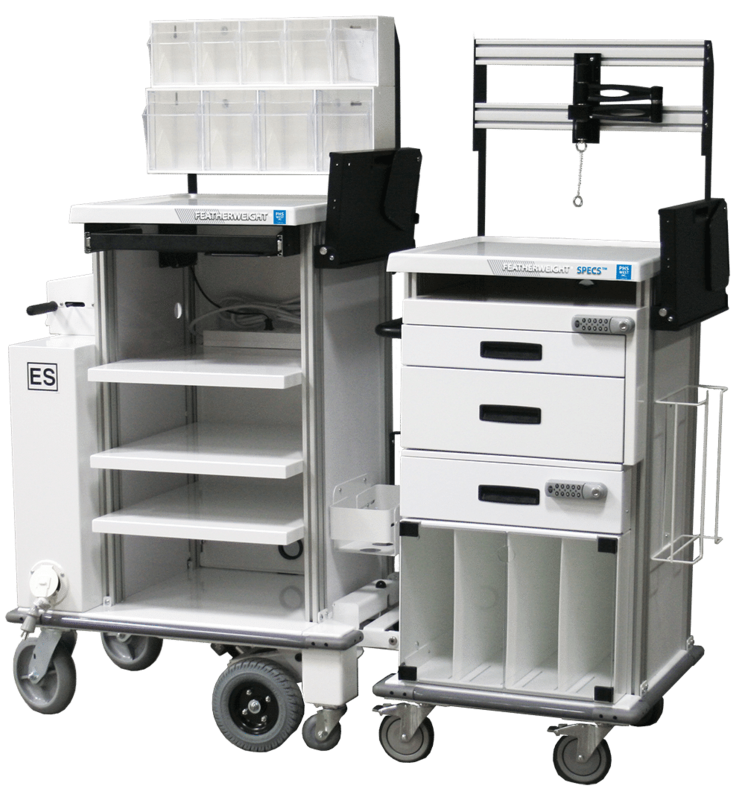 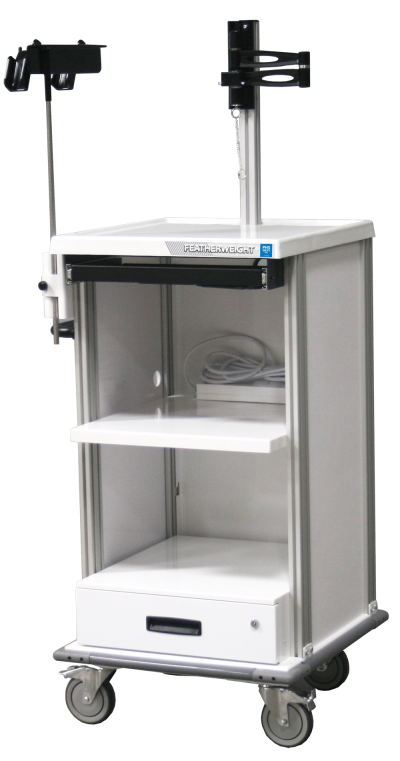 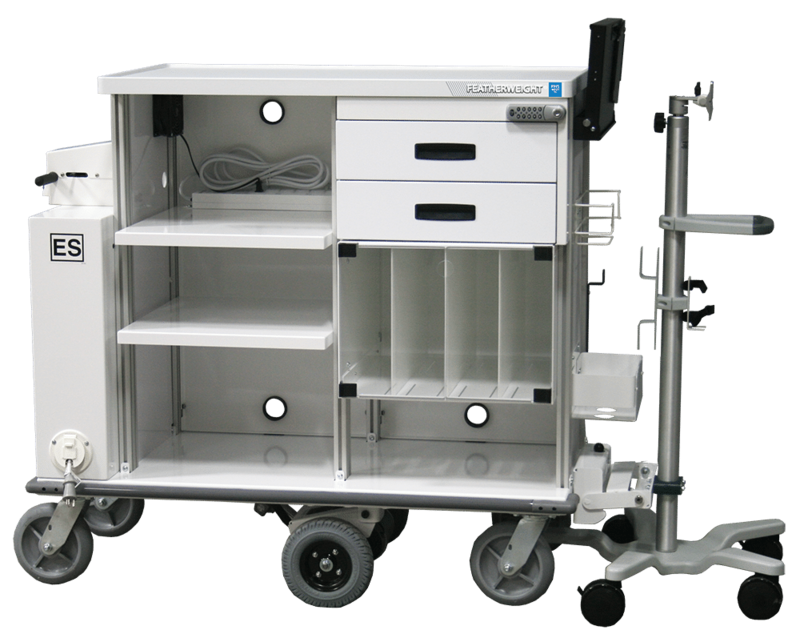 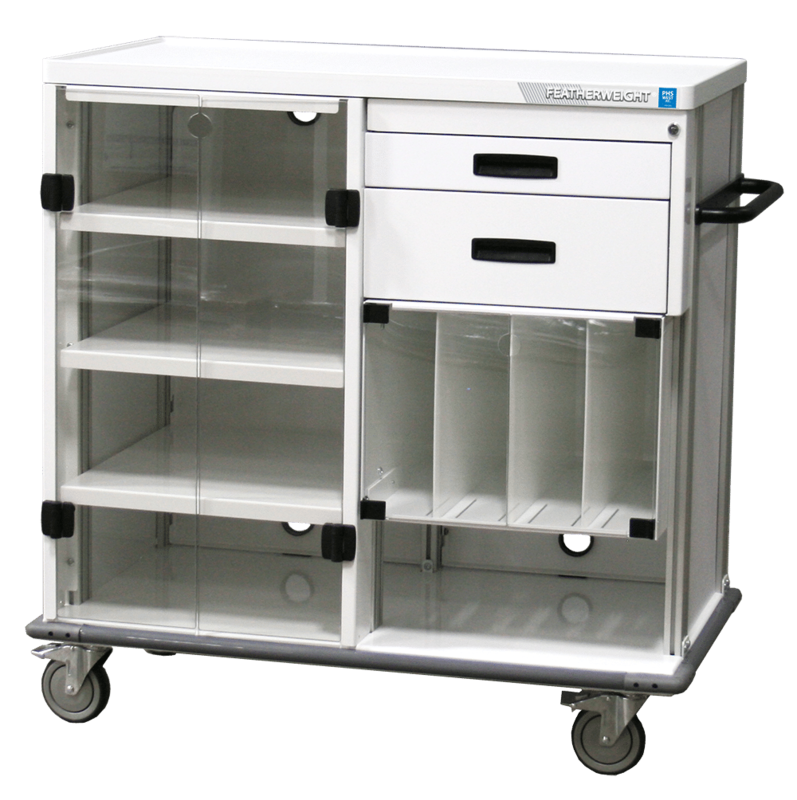 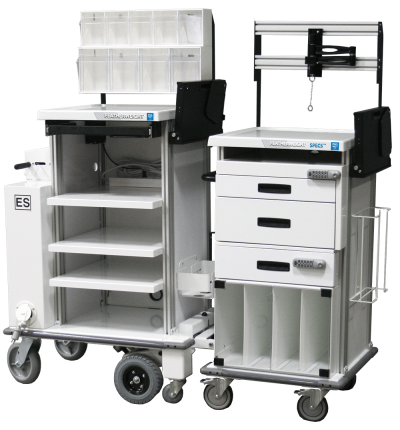 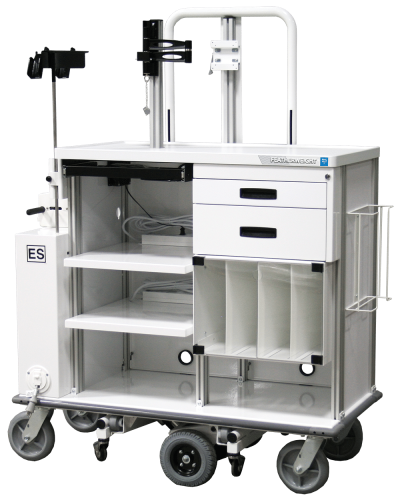 Our Featherweight® Double Endoscopy Cart design allows for all equipment and supplies to be located on one cart. 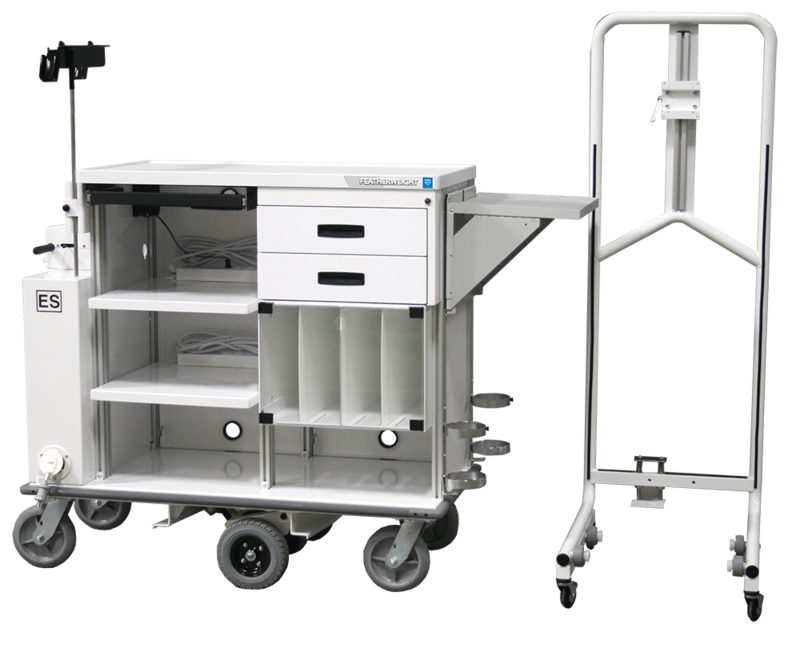 Positioning allows everything to be located where it needs to be for convenient access mid-procedure for all parties including doctors, nurses, and technicians. 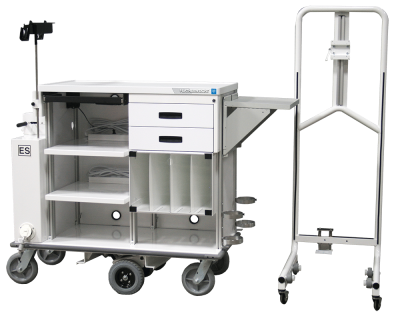 For situations where something small and simple is needed in a confined procedure room, the Featherweight® Single Short Endoscopy Cart fits the bill. 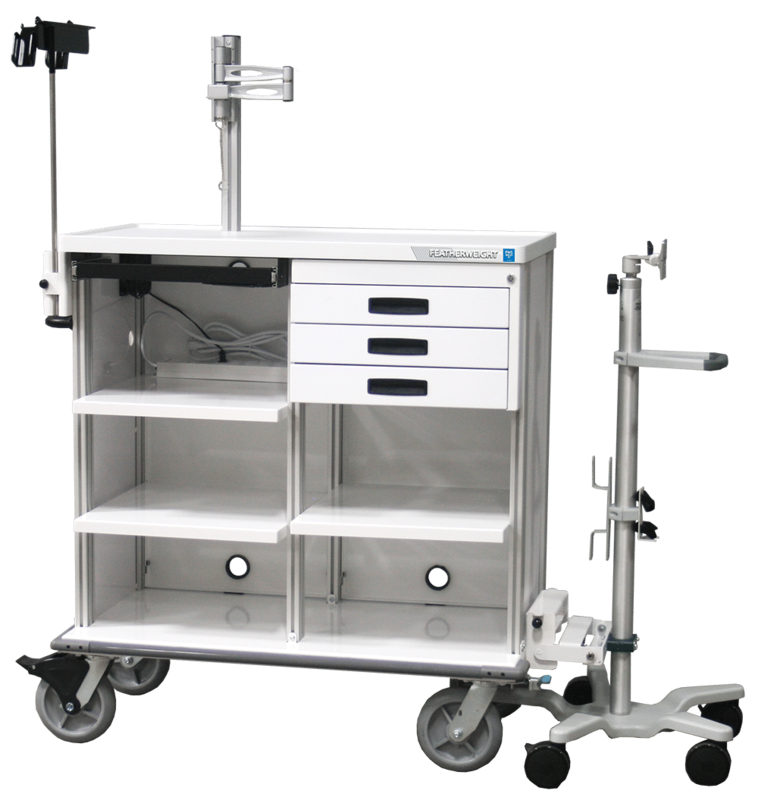 In situations where redundant pieces of equipment or if supplies are needed on a cart, when a small footprint is necessary, the Featherweight® Single Tower Endoscopy Cart is an excellent choice. All of the equipment necessary for every travel case is on a motorized cart. The supplies are organized in a trailer supply cart which is specific to individual procedures. The image monitor is on a rolling monitor stand that connects to the whole system. 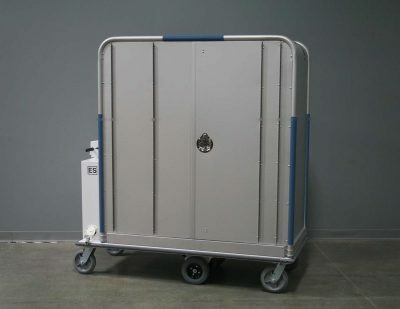 Grab the motorized equipment cart, connect the supply trailer and image monitor and off you go. 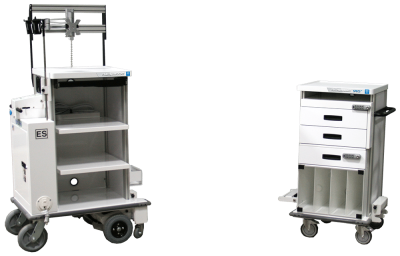 All three pieces separate and are individually positioned in the patient’s room. 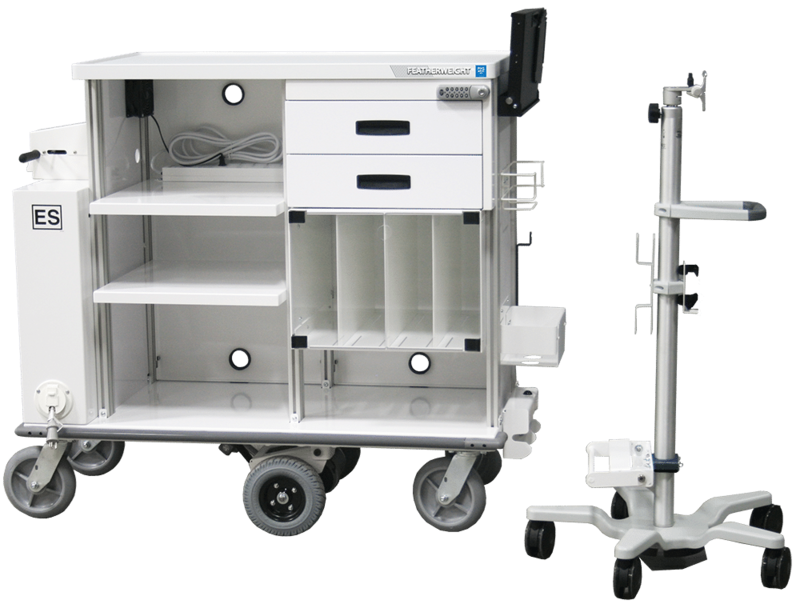 As the mainstay of PHS motorized travel carts, the Featherweight® Motorized Double Endoscopy Cart has everything you need and nothing you don’t. 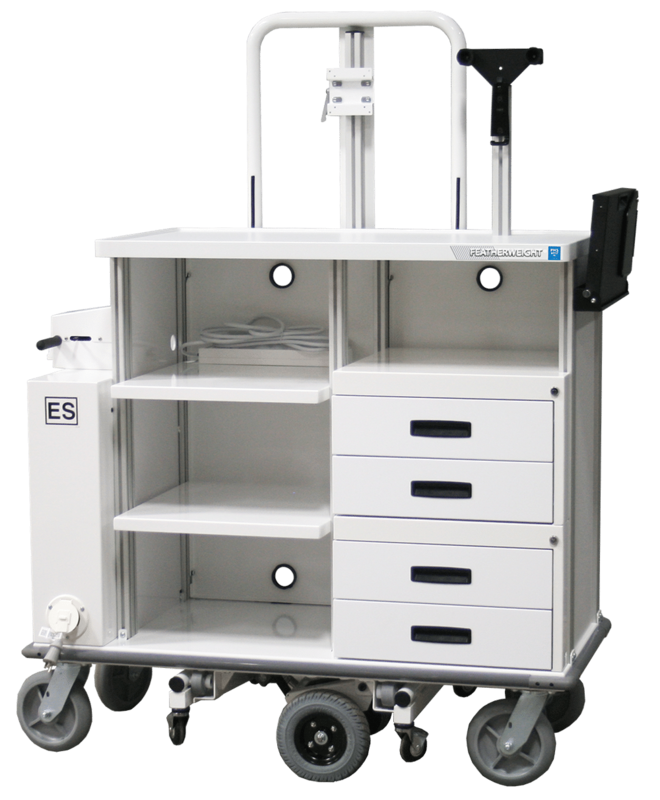 Every endoscopy cart is designed by you with the aid of Karis sales and design consultants to ensure all of your equipment and supplies are organized optimally for your work flow at the patients bedside. 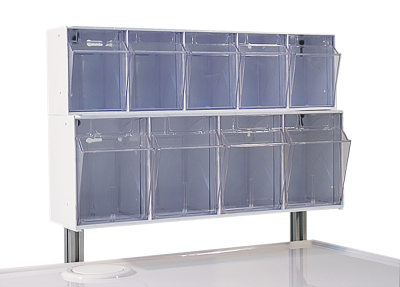 Multiple drawer size combinations are available in the “gang” locking drawer cabinets. Operating one lock will secure all of the drawers in one cabinet instead of needing to lock drawers individually. 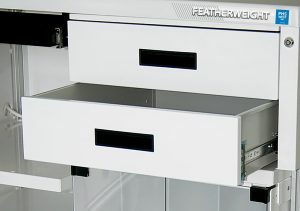 These 4”, 6”, 8”, and 12” drawers can stack up in any combination equaling a total of 12”. 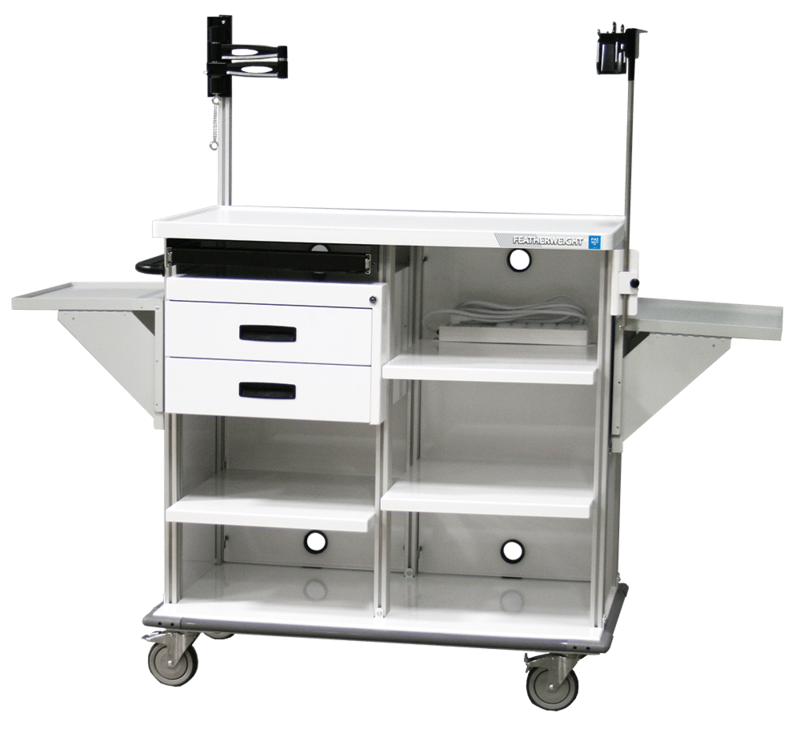 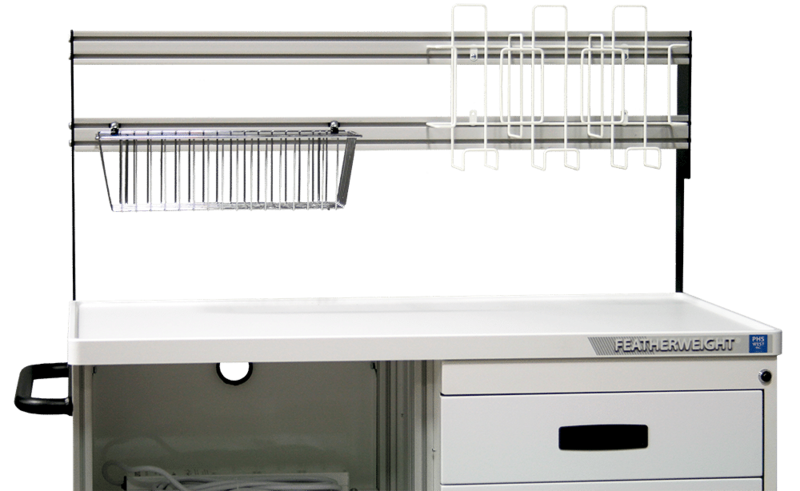 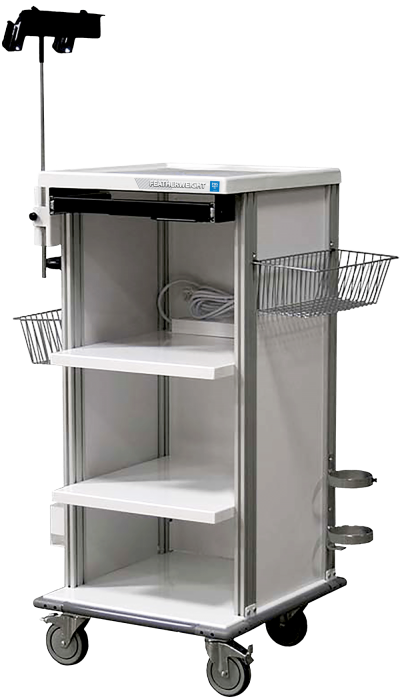 Depending on the cart model you choose, the equipment required on the cart, and any other accessories, multiple drawer cabinets can be accommodated in your design. Individual 6” drawers not housed within the multi-drawer cabinet are optional. 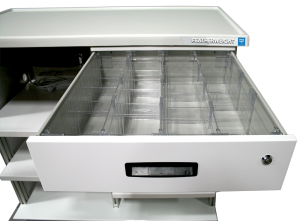 Insert drawer dividers into any drawer for superior organization. 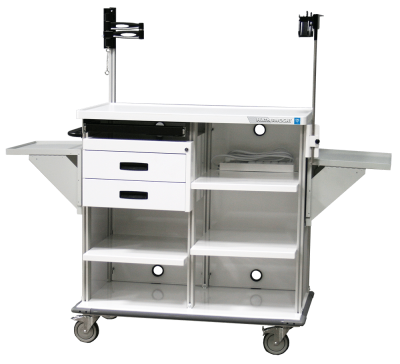 Dividers can be adjusted front to back and side to side to accommodate different sizes of supplies. 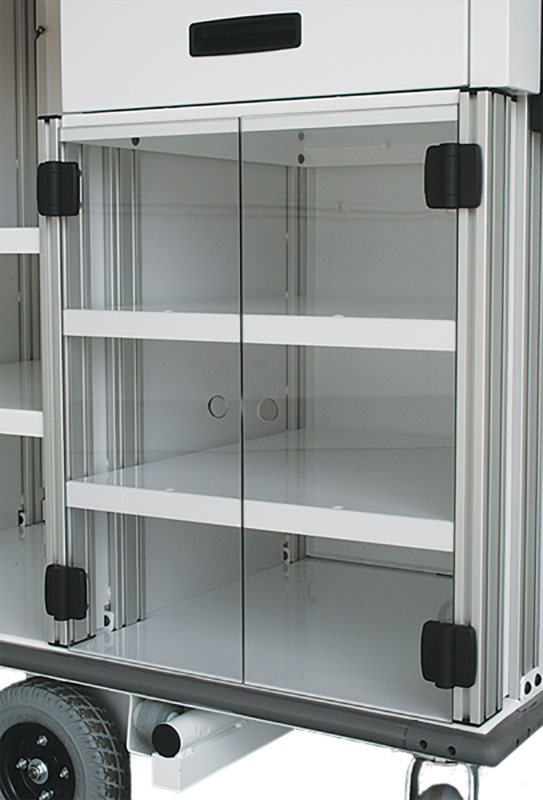 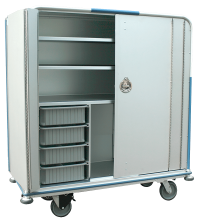 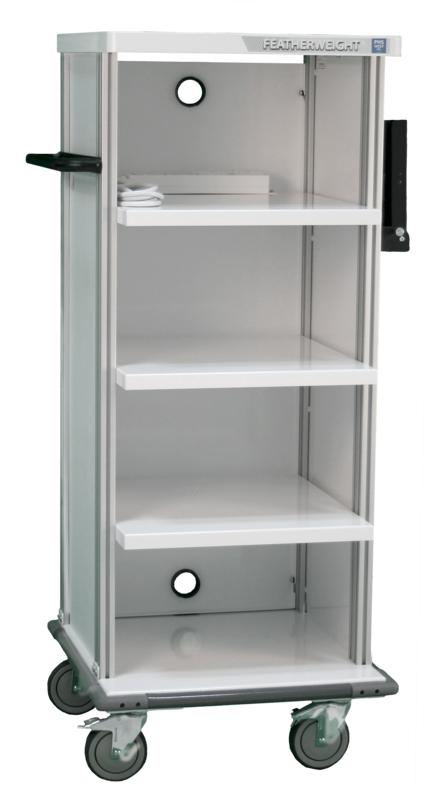 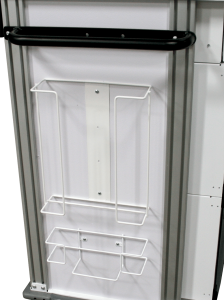 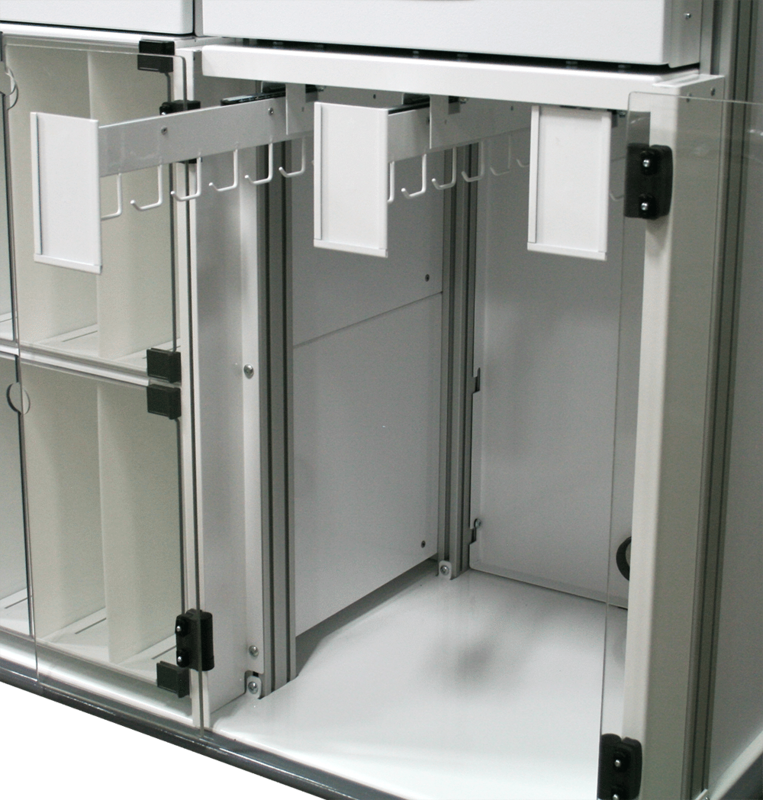 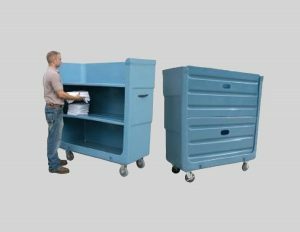 A variety of storage cabinet options are available and are based on the type of supplies which are used during procedures. 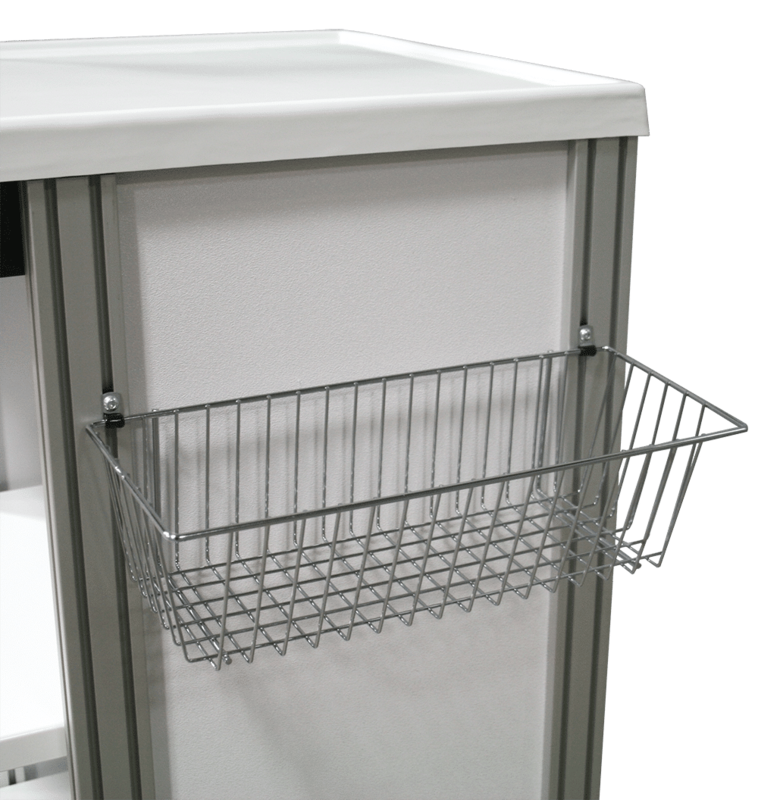 For storage of small items, tilt bins on a riser are an option for any cart. Combinations available with four large bins and/or five small bins with an optional upgrade to locking bins. 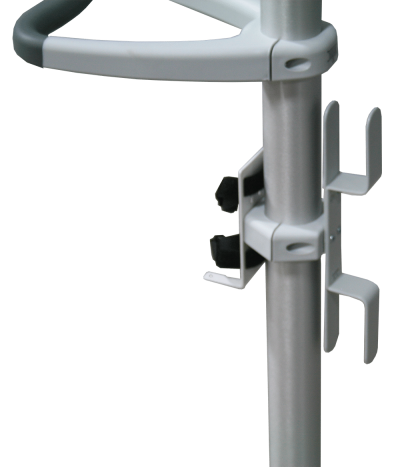 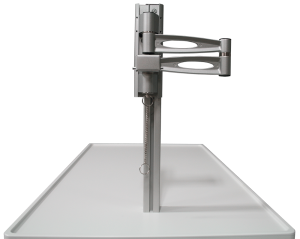 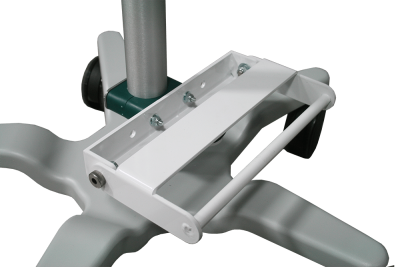 Scope Holders are designed to fit scopes in the manner in which the manufacture intended are a common option. 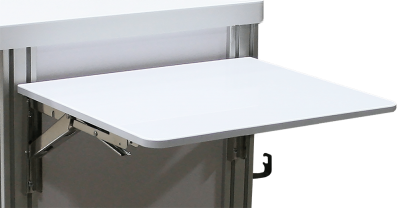 Securely drape the scope to free space on the work surface for other uses. The fold down Keyboard Tray and Mouse Surface locks up in place securely, storing the keyboard when not in use. 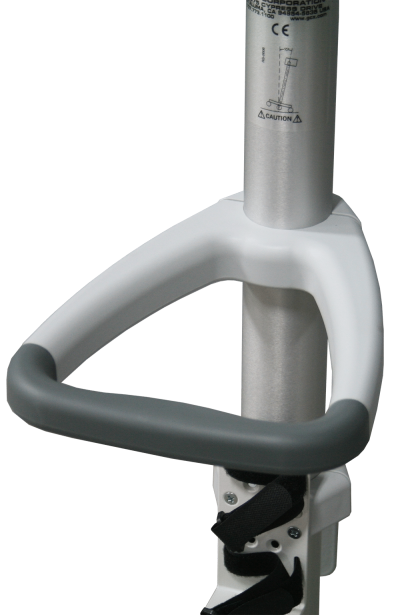 It also folds down off of the end of the cart to use in its convenient location next to a monitor to ensure maximum efficiency during data entry. 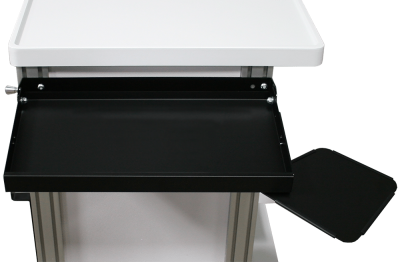 The slide out Keyboard Tray and Mouse Surface are stored securely under the work surface off the cart and glide out easily when needed. 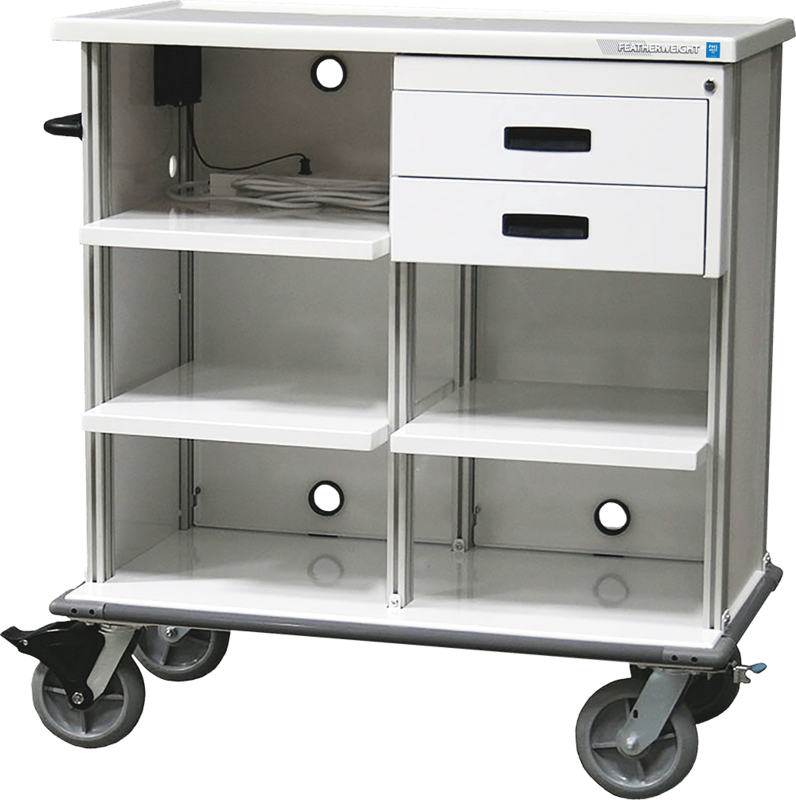 Store the foot pedals of your equipment on the outside of the cart freeing up space inside for other storage needs. 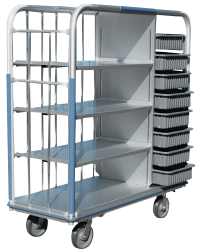 Wire baskets fix to the end of the cart for extra storage when needed. The flip up work surface is added to the end of a cart for extra working space. 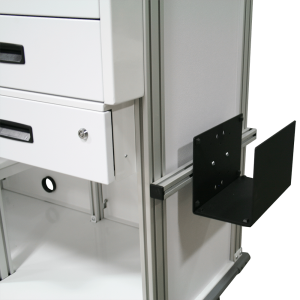 Fold down when not in use and flip up with braces that fall into place when needed. When space is at a premium within the cart, mounting the computer on the outside edge may be the perfect solution for making everything fit. 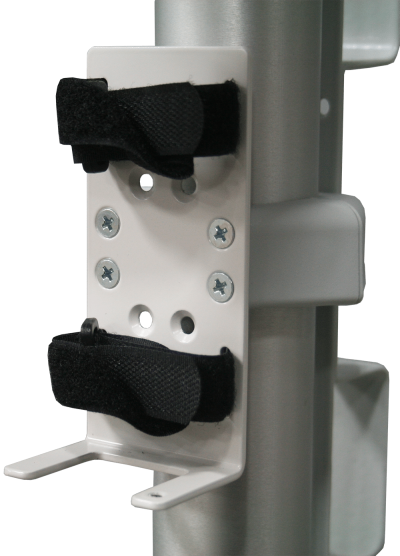 Several different mounting options available based on your specific monitor needs. 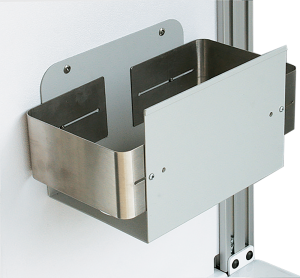 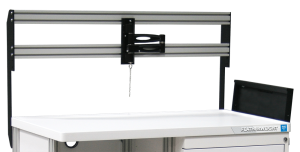 Free up space on your work surface by mounting your Monitor Arm to the Monitor Riser. 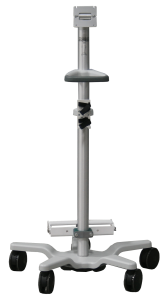 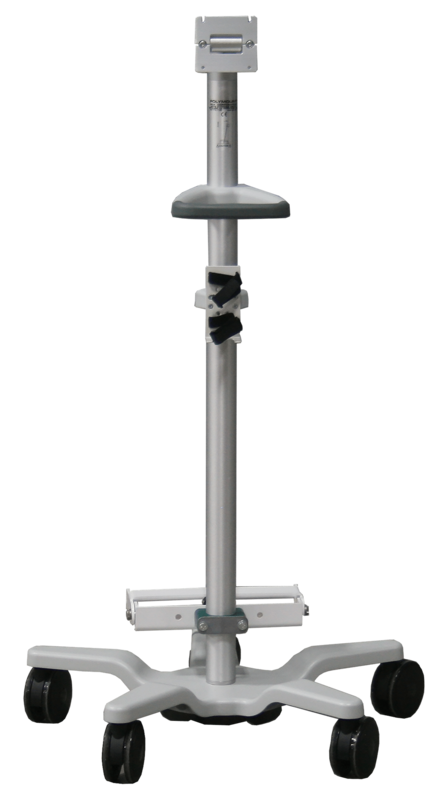 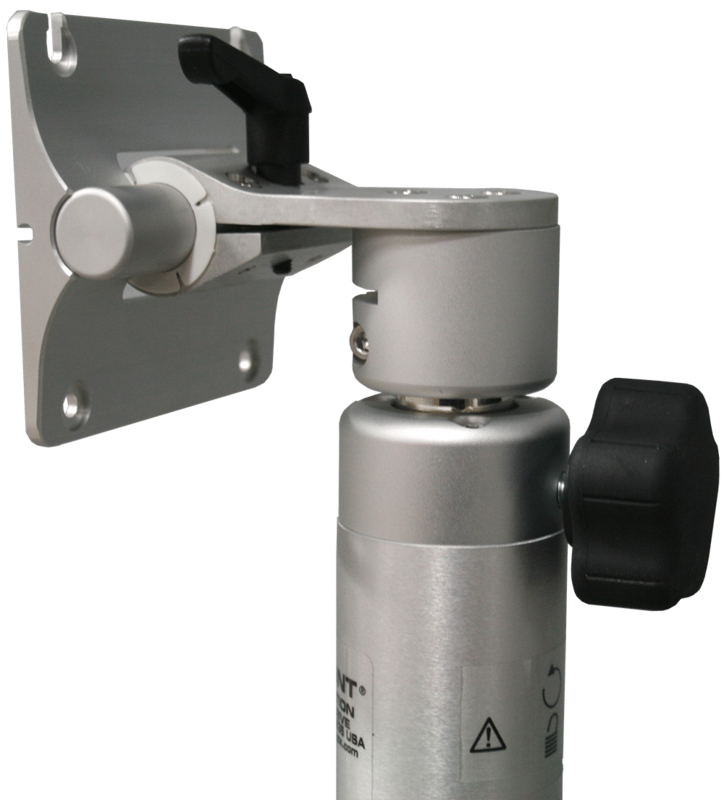 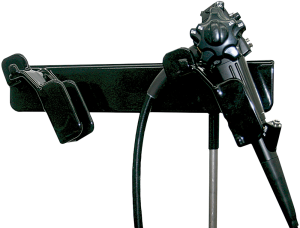 The Featherweight® Monitor Stands can be conveniently positioned for easy view of the scope image in endoscopy procedure rooms. Travel cases are made even easier by connecting the Monitor Stand to your travel cart for transport. Once at the patient’s bedside, the Monitor Stand disconnects from the travel cart allowing normal positioning capabilities in procedure rooms. Featherweight®line of Linen Carts is lightweight, durable, and provides a wide variety of design options. This allows us to meet every individual requirement you may have; including but not limited to spatial limitations, shelving configurations, closure methods, and budget. 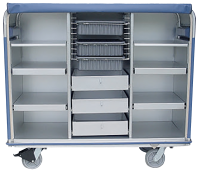 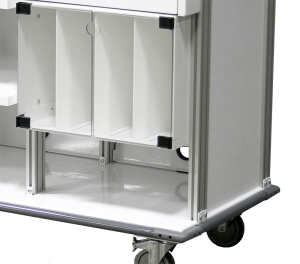 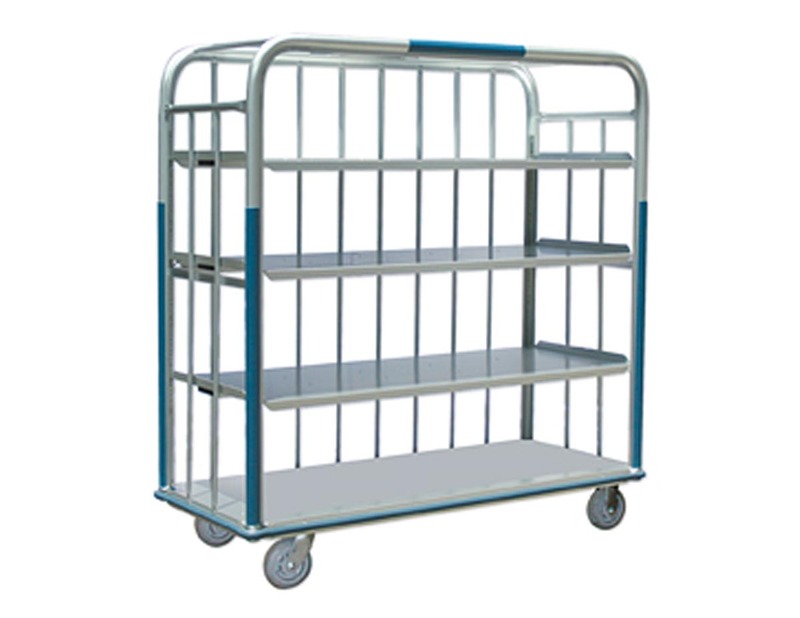 If you are transporting your linen carts long distances or the weight of the carts is a concern for staff safety, all Featherweight® Linen Carts can be combined with an Ergo-Express® power drive system. 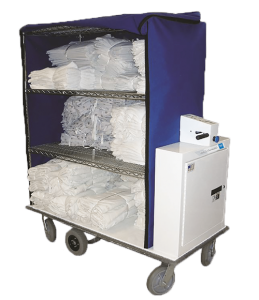 Our prime focus in every Featherweight® Linen Cart we build is maximizing the space available for storage, organizing the linen within the cart, while providing a secure and user friendly barrier for the clean linen. 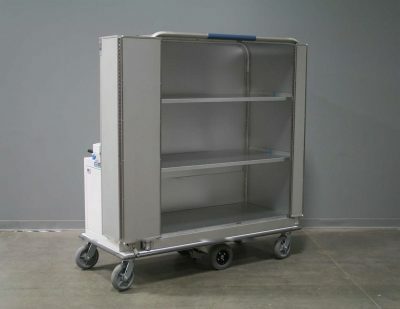 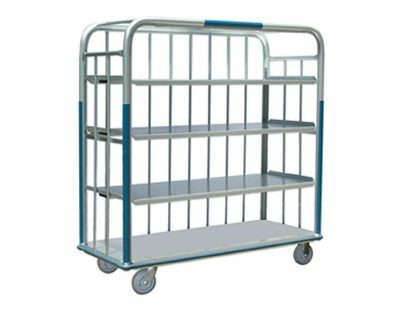 Maximize the efficiency of your restock process by reducing the number of trips walking back to your linen department with an empty cart. 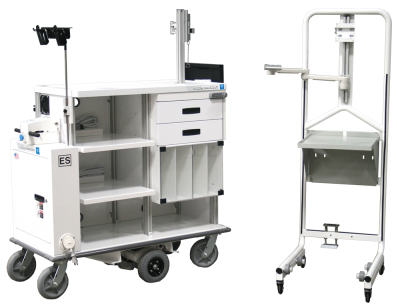 By implementing the Featherweight® Linen Cart with the Ergo-Express® power drive system, one staff member will safely transport up to 1,500lb. 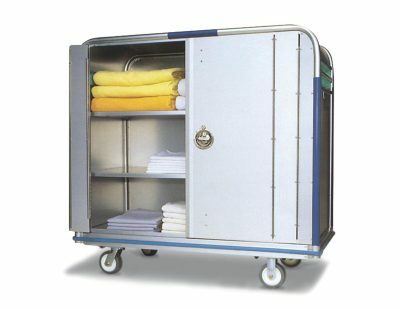 of clean linen in a single trip. Featherweight® Linen Collection Carts and Bulk Carts are perfect for handling whatever size load you require. 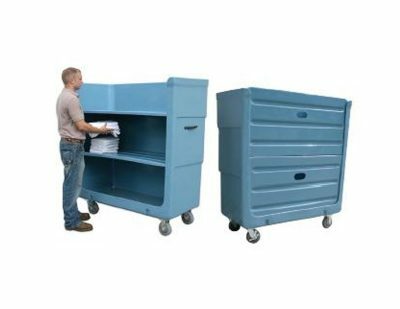 High strength, reinforced, seamless fiberglass construction is three times stronger than similar poly carts and is easily repaired. 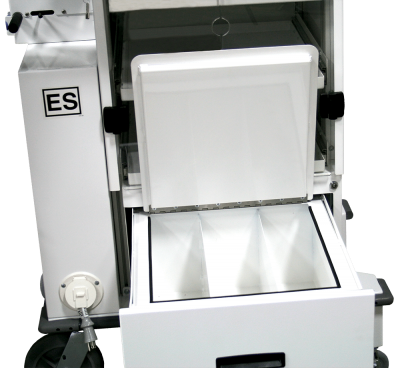 No sensitivity to temperature change or cleaning process/chemicals. Ergo-Express® Motorized Carts and Motorized Tugs will drastically increase your efficiency by allowing you to transport 1500lb. of linen in one trip. 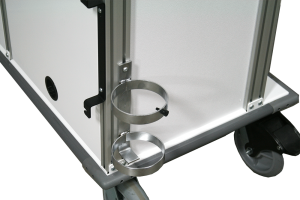 Additionally any risk of staff injury due to push or pull force is virtually eliminated. 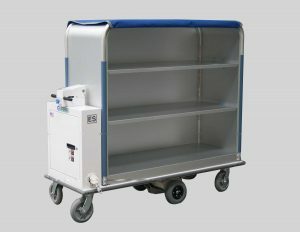 Any Featherweight® Linen Cart has the option of being up fitted with the Ergo-Express® power drive system. 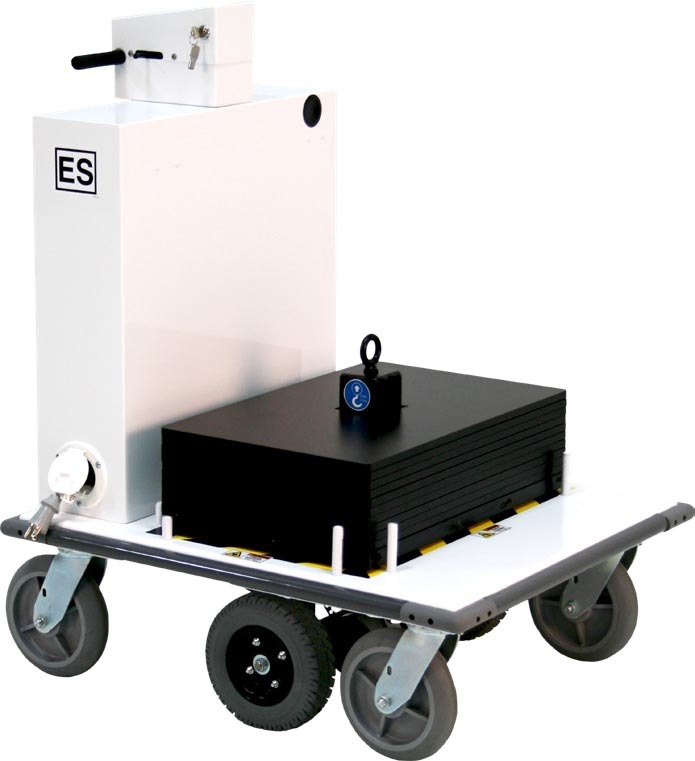 The Ergo-Express® Motorized Linen Cart Tug can tow up to 5,000lbs of clean or soiled linen carts (one at a time or in a train with our coupling hitch systems). 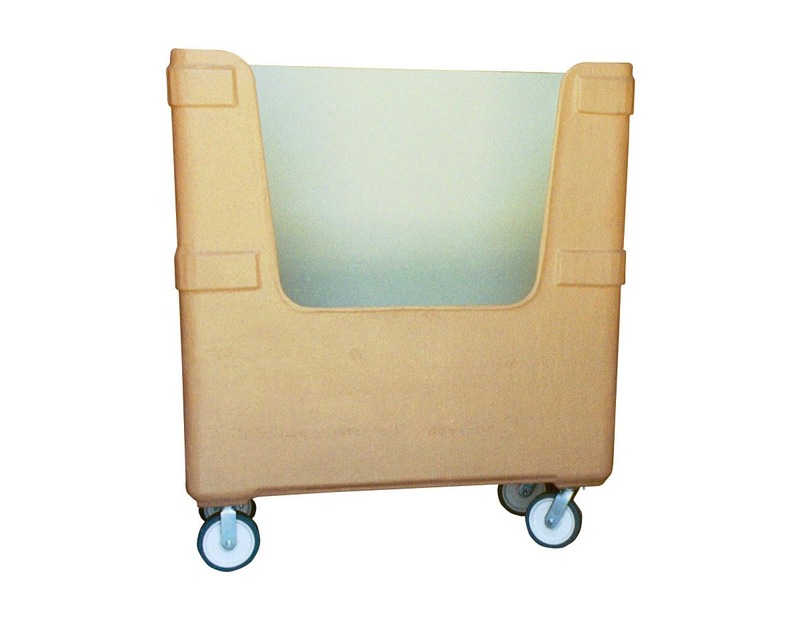 Now one staff member can do the job of many with no risk of push/pull injury. 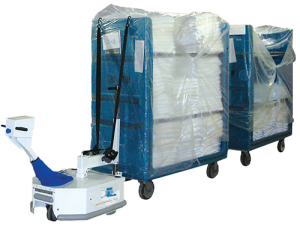 Up and down ramps, over carpeted hallways and over long distances, transporting heavy linen is effortless with a motorized tug. The Ergo-Express® Motorized Ceiling Lift Load Test Carts are used to safely transport weights for load testing ceiling lifts. Whether you choose to have a multi-selection weight kit, a single weight, or retrofit your own weights on to our motorized transport cart, Karis. 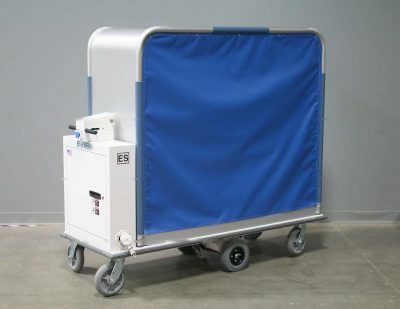 has you covered. 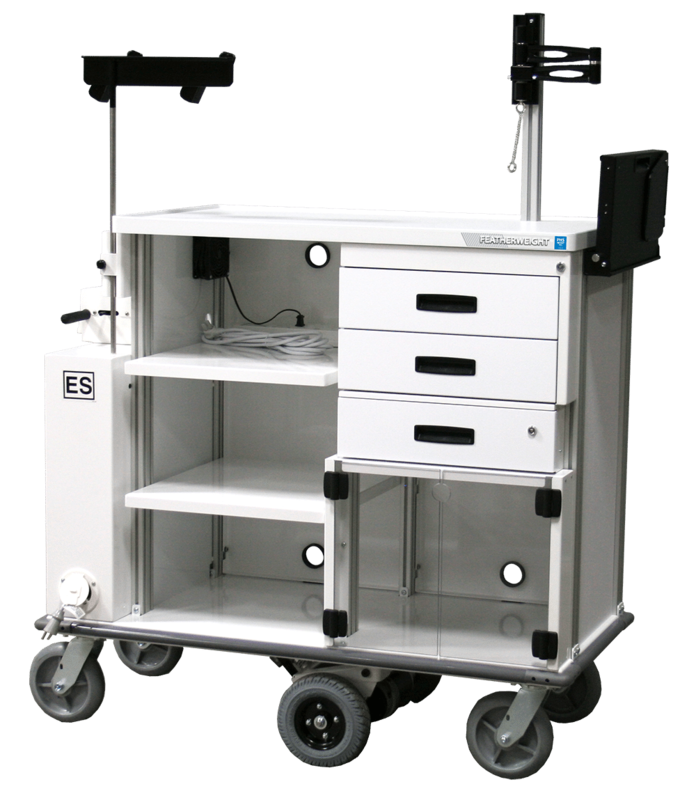 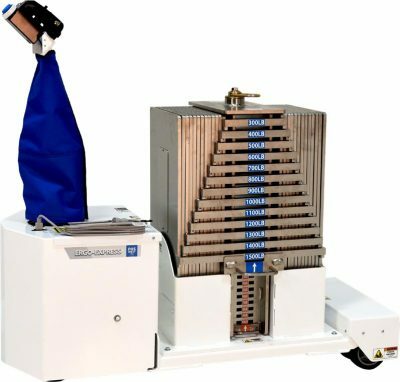 The Ergo-Express® Motorized Ceiling Lift Load Test Cart offers an immediate return on investment allowing one staff member to perform a task that previously took two to three. With the option of testing different weights all on one cart, you eliminate the need for multiple staff to complete one test. 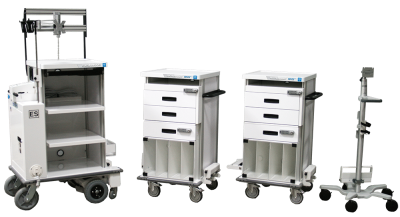 Increase employee morale simply because staff will no longer return home tired and sore. 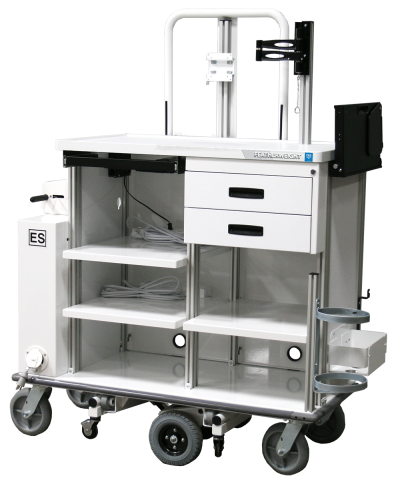 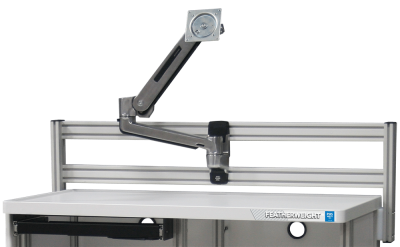 The Ergo-Express® Motorized Ceiling Lift Load Test Cart | Single Weight allows one person to perform all load testing in an efficient manner. 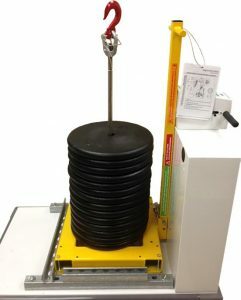 A single weight for testing may be transported throughout a facility with little strain on the employee. 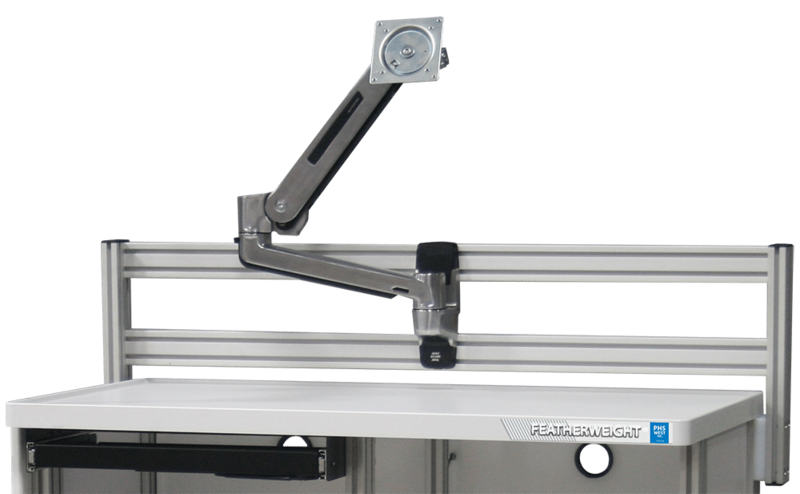 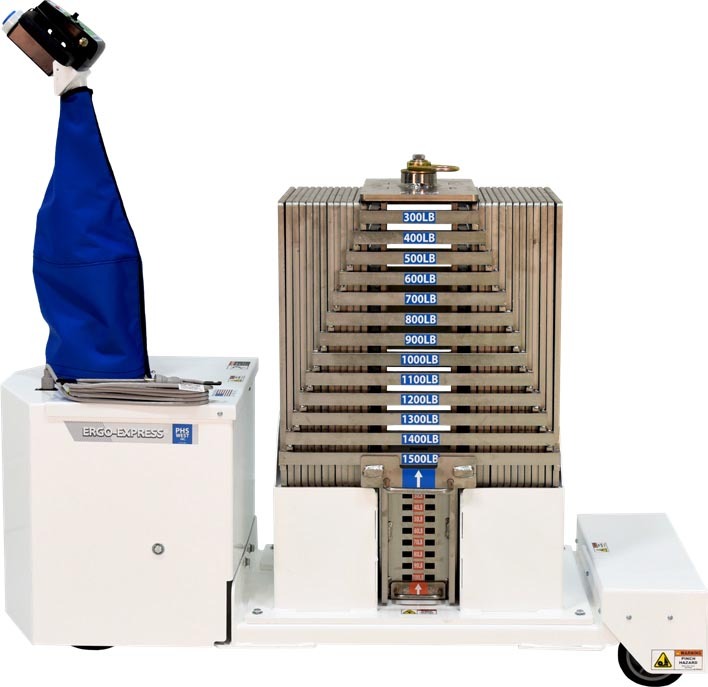 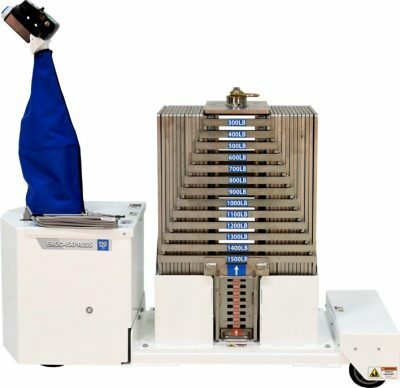 Retrofitting options are available with the Ergo-Express® Motorized Ceiling Lift Load Test Cart. 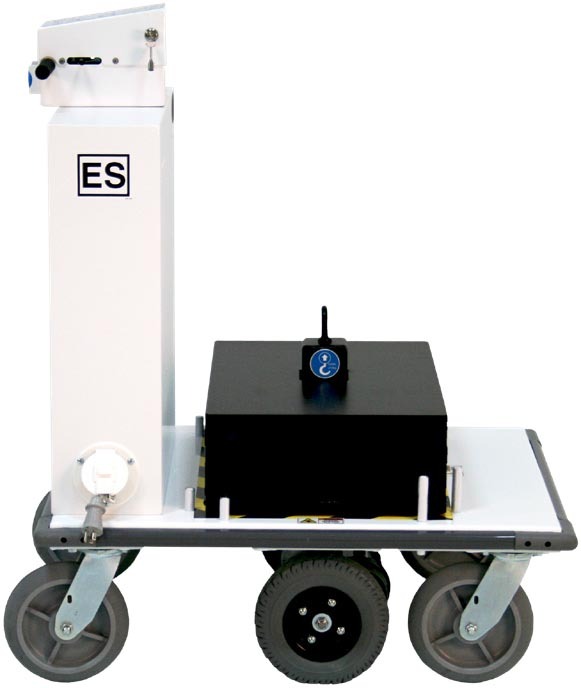 Allow us to create the motorized transport cart that will house your weights used for load testing. 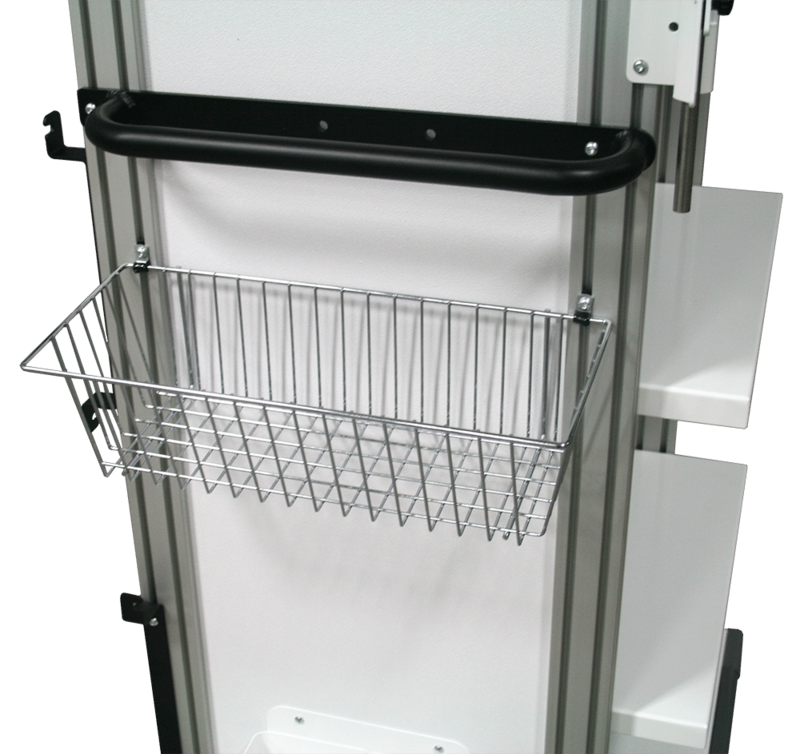 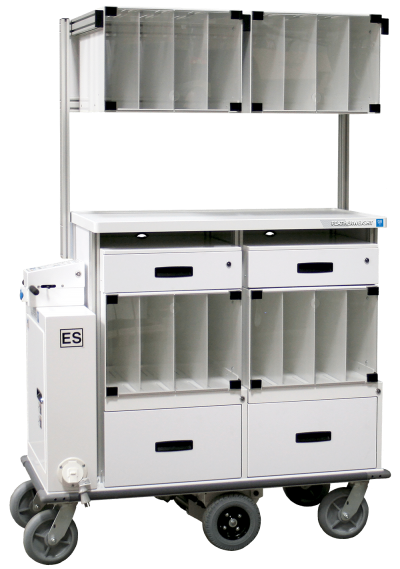 Maximize the efficiency of your restock or exchange process by reducing the time spent moving an empty cart. 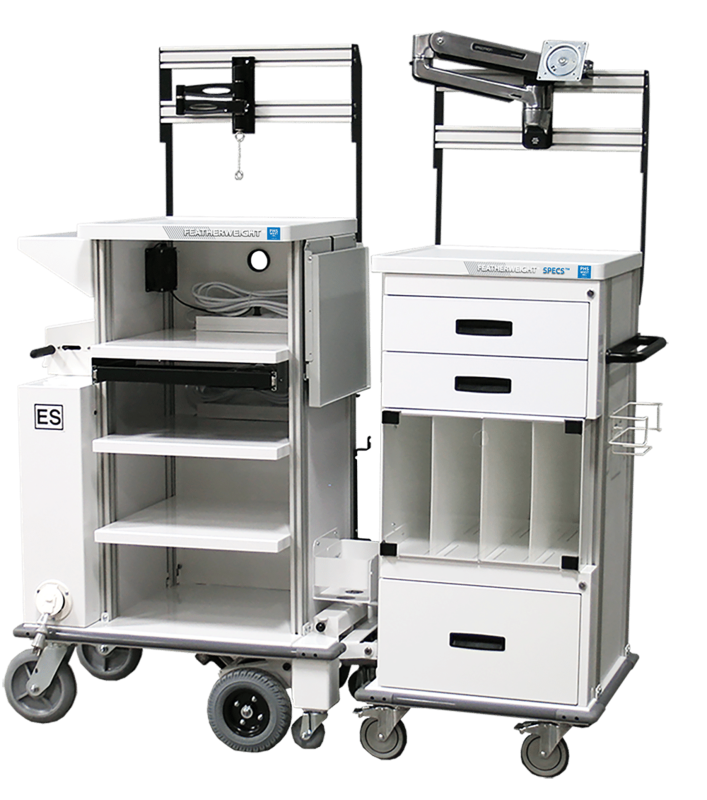 Implementing the Featherweight® Supply Distribution Cart with an Ergo-Express® power drive system, one staff member will safely transport three times the amount of supplies in one trip. 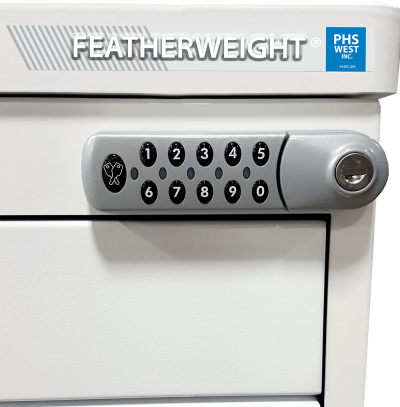 The focus of every Featherweight® Supply Cart we design is on maximizing efficiency, storage space available and your required configuration.